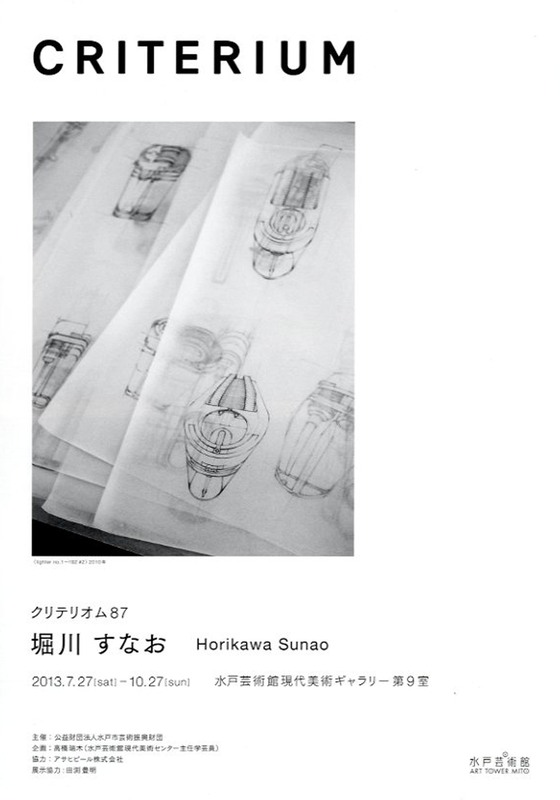 "SUNAO HORIKAWA Window Display Work"
I met the Mayor of East Osaka to show my Art work. 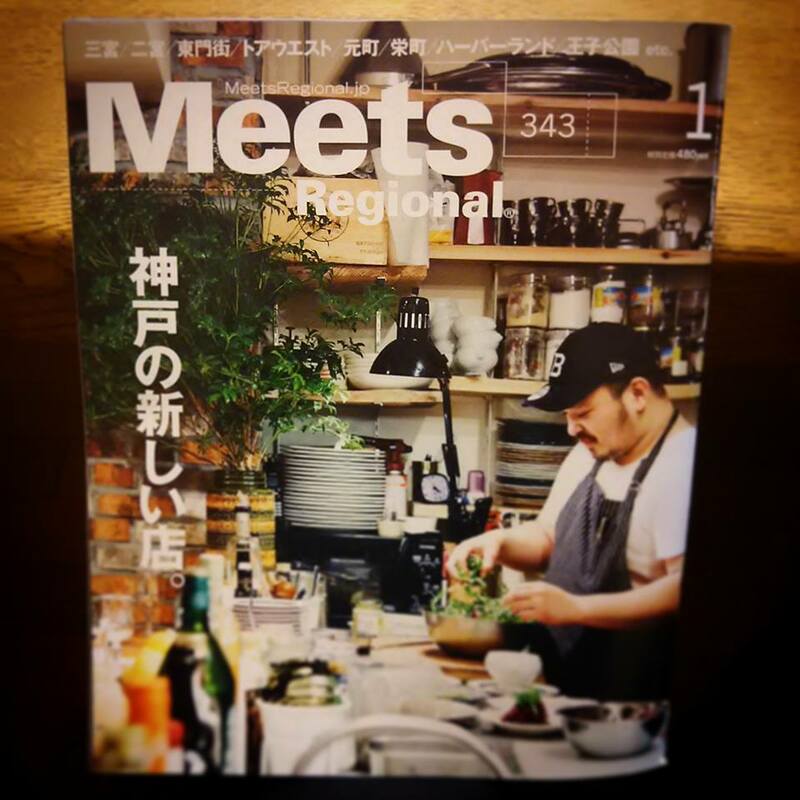 The meeting was featured on TV. 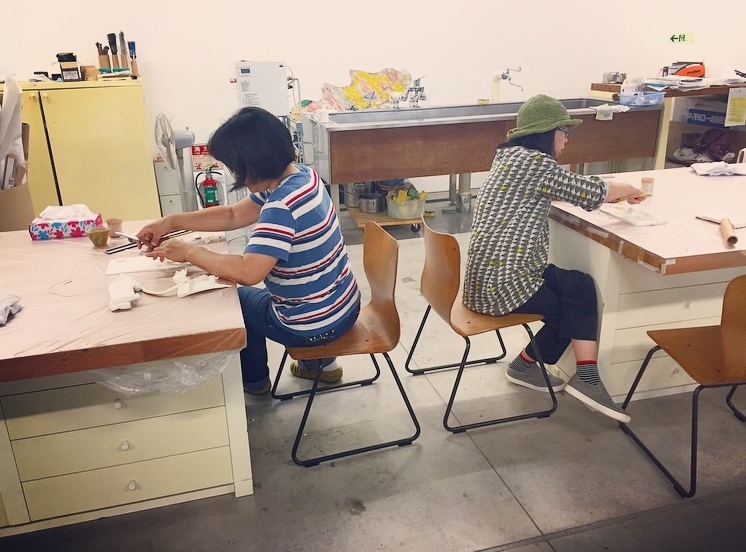 My art workshop was held at a challenged facility in Aomori prefecture. 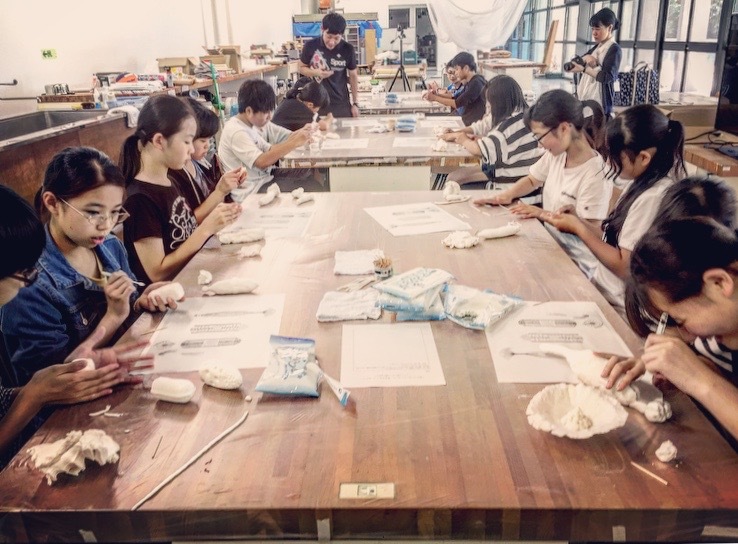 My art work shop was held at ACAC for junior hight school students. 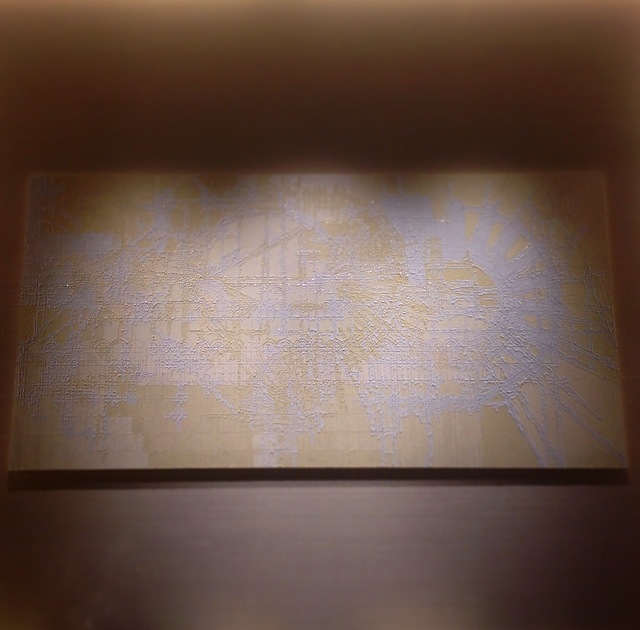 "How we are understand two dimensions." 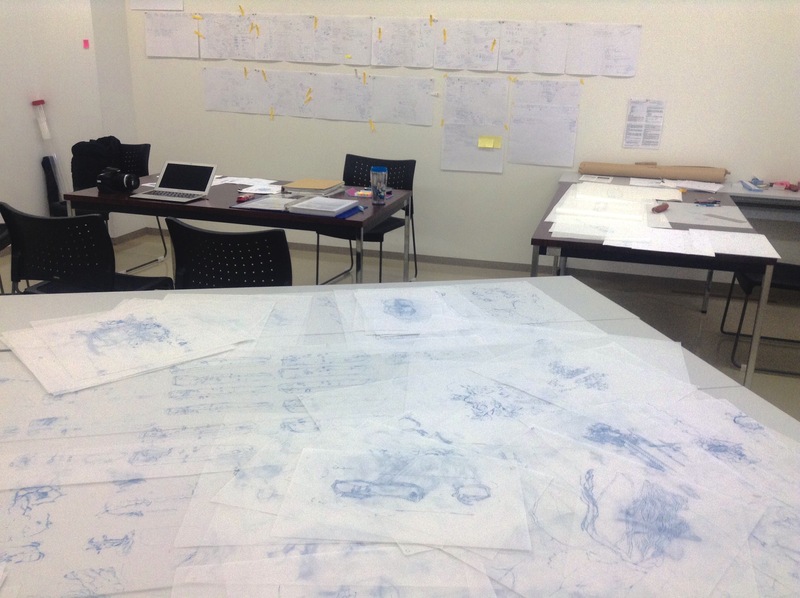 My art work shop at ACAC. 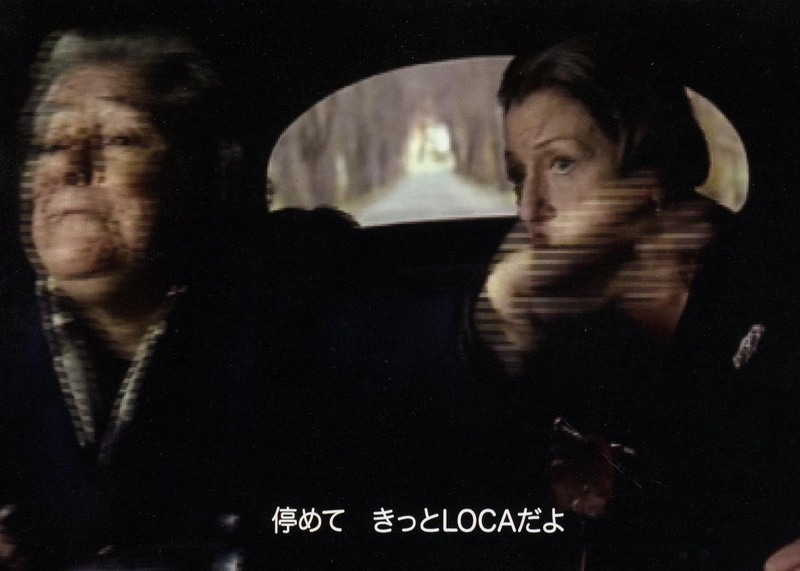 "How people understand an Existence and how convey of it." 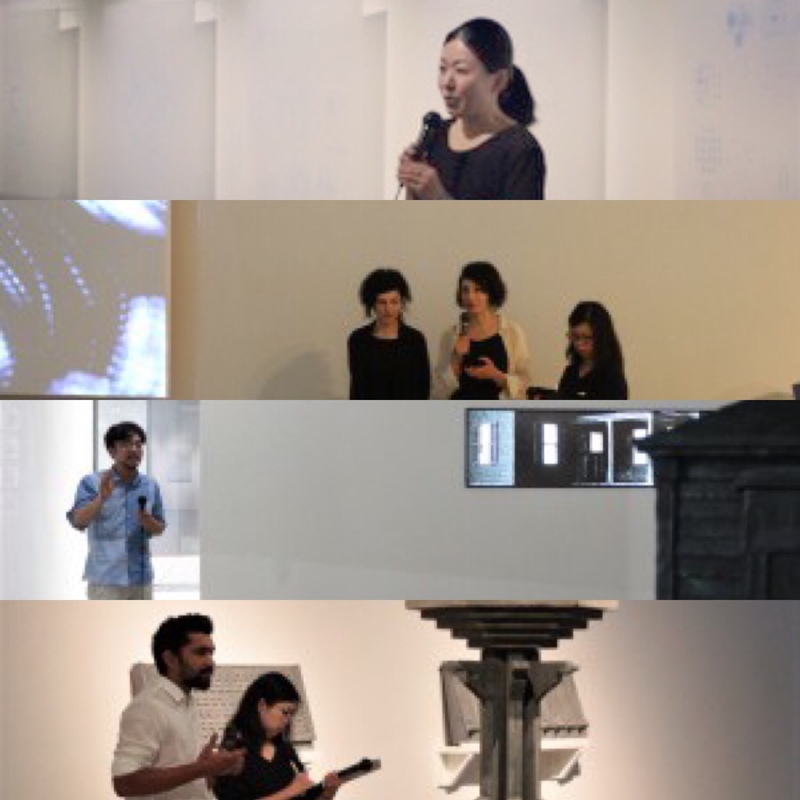 ACAC 2018 summer AIR Opening Artist Talk was held on July 28, 2018. 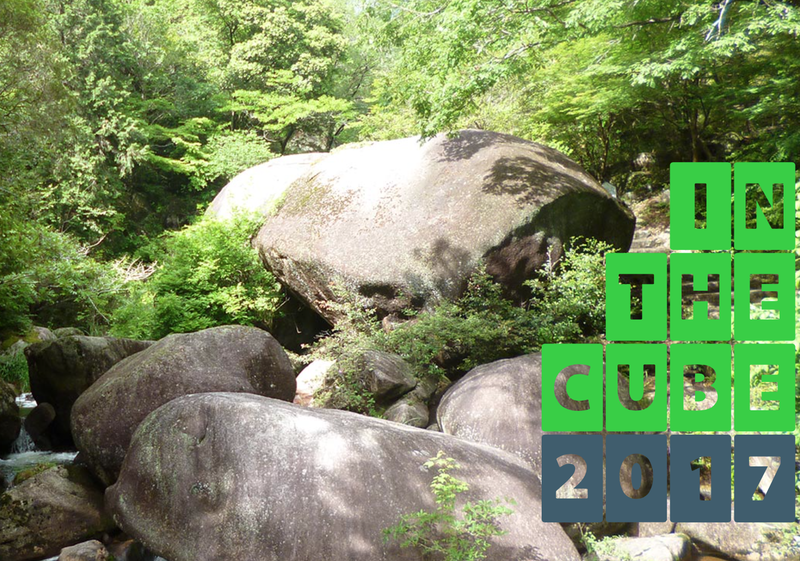 Throughout the course of our lives, we belong to communities such as families, schools, companies, and peer groups. 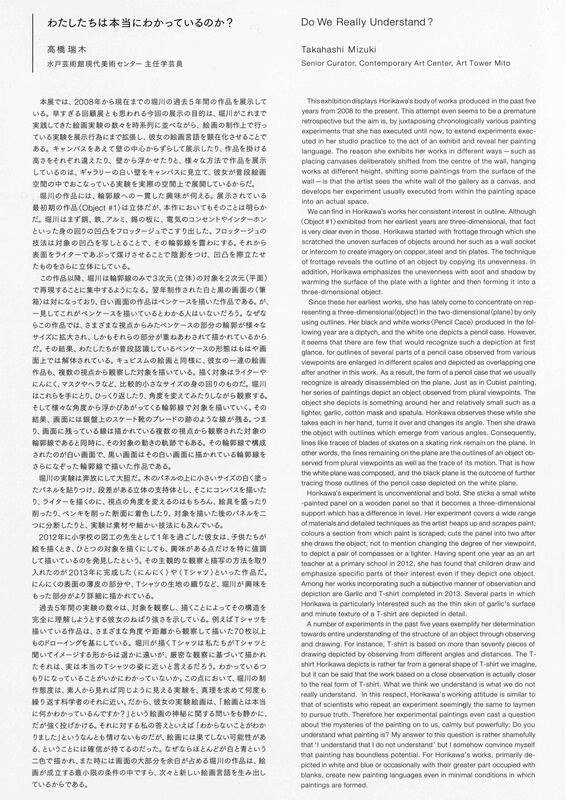 We classify things--either consciously or subconsciously--and tend to assign rules and give order to them to interpret them as larger constructs and frameworks such as ethnicity, gender, language, ideology, or politics. 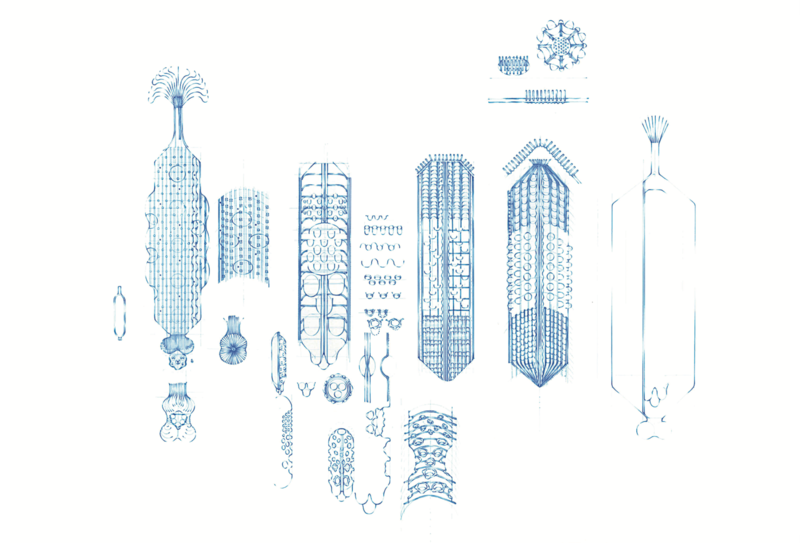 These frameworks can seem like indomitable institutions to living beings as short-lived and fragile as humans and can be a help or a hindrance depending on one's circumstances. 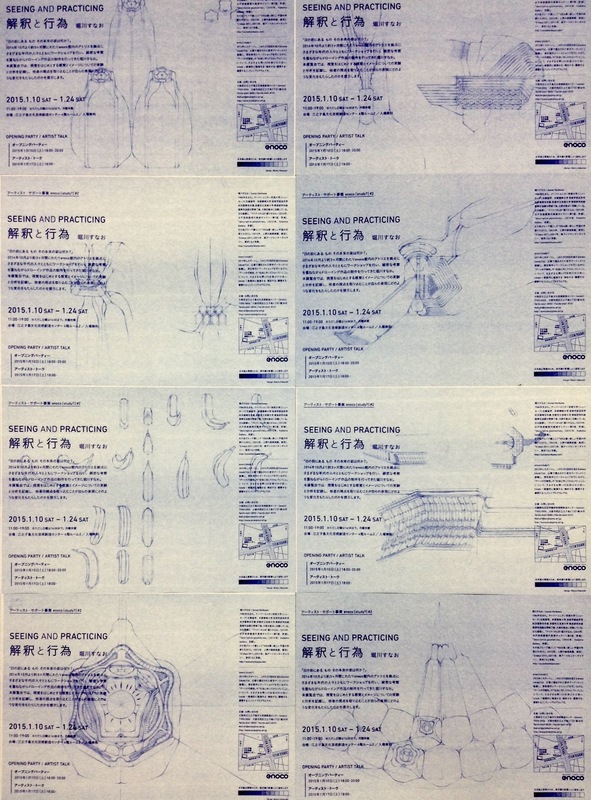 But take a look inside any one of them and you'll discover a continuous internal motion that transforms the very notions that these frameworks are meant to govern. 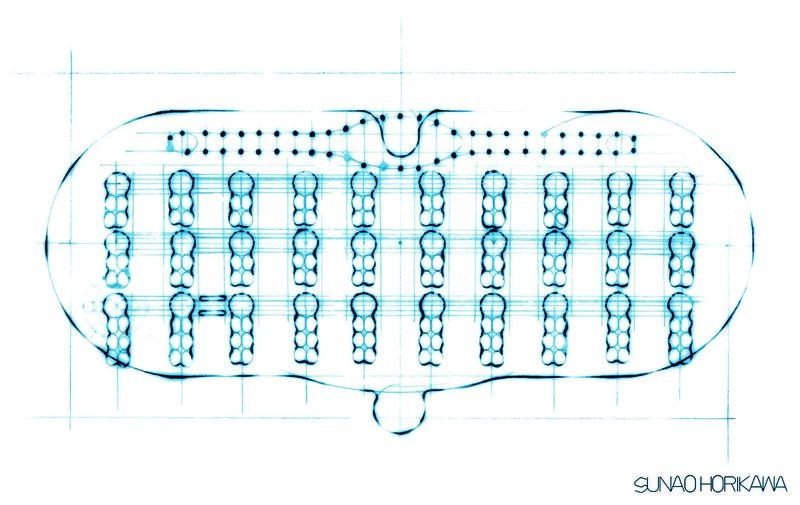 Once you are attuned to this movement, you begin to realize that these immutable frameworks are actually in a constant state of motion, and the vague contours of their structures come slowly into view. 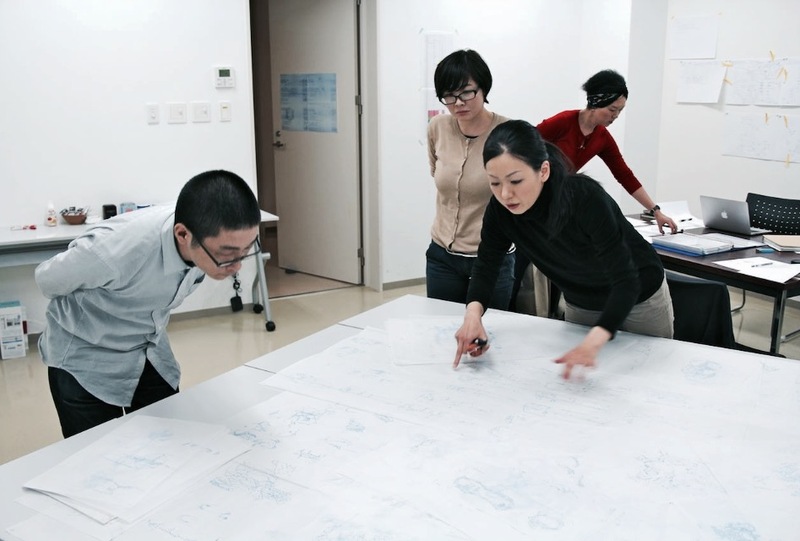 Artists constantly ask themselves questions during the creative process, questions that address how to interpret their environment and how to observe what is right in front of them. 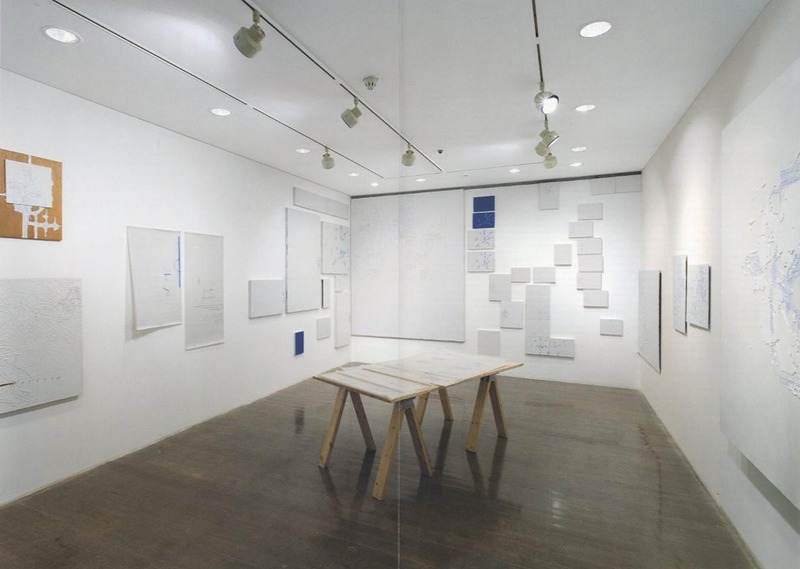 One could even argue that art exists because we continue to question its very definition. 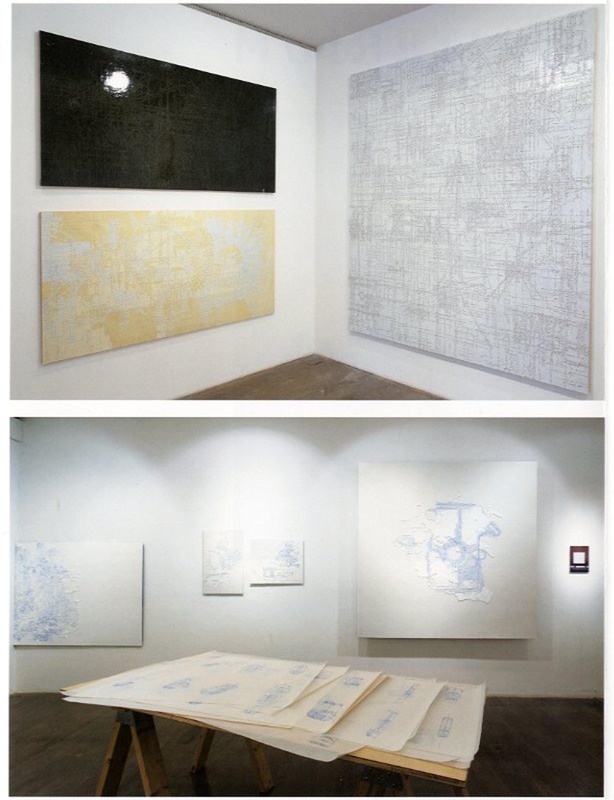 Art can remove the frameworks that we are convinced exist and it can create new frameworks that we have yet to imagine. 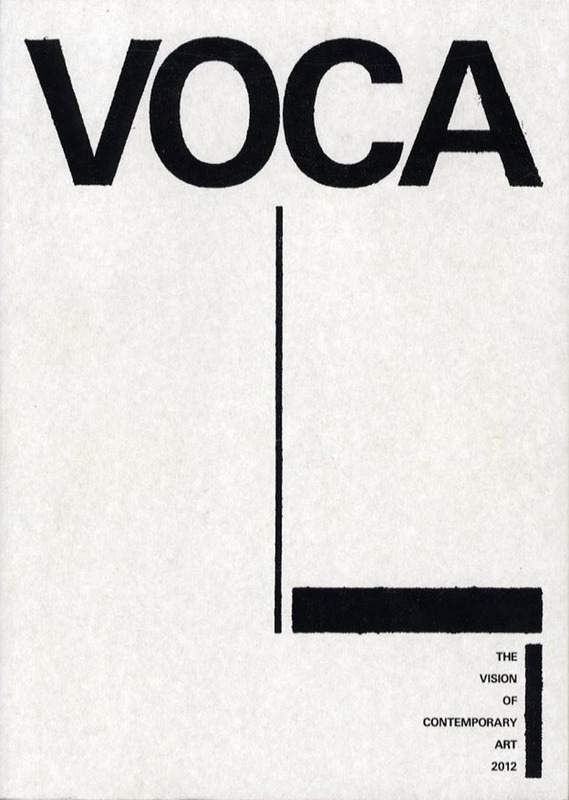 It possesses the power to change how we view the world. 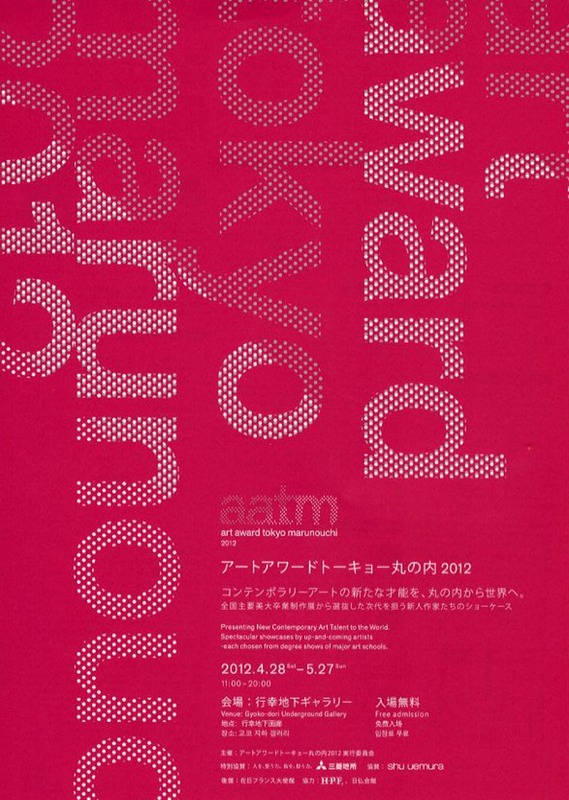 This exhibition highlights the rules, structures, and order of those frameworks and their constant motion. 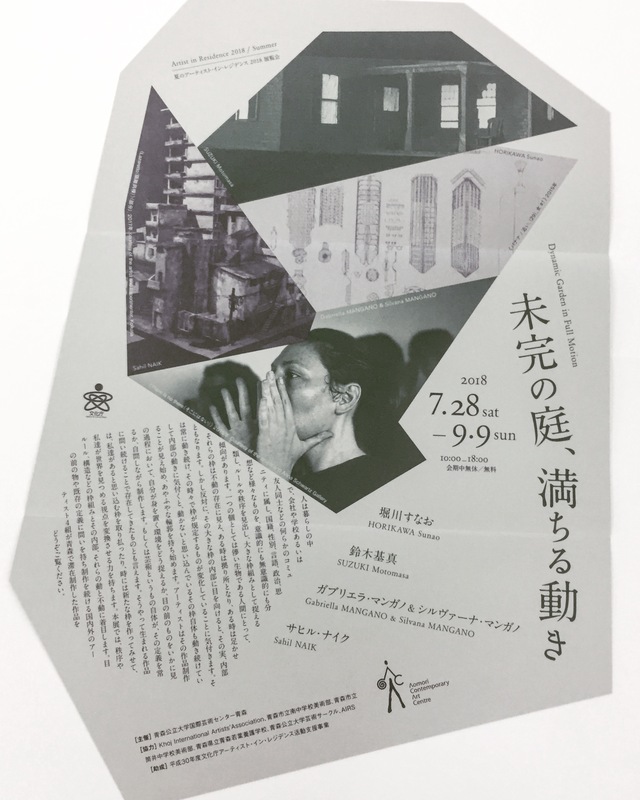 The Aomori Contemporary Art Centre (ACAC) is pleased to welcome to its artist-in-residence program five artists from Japan and abroad who continue to produce works that question our pre-existing definitions of the world. 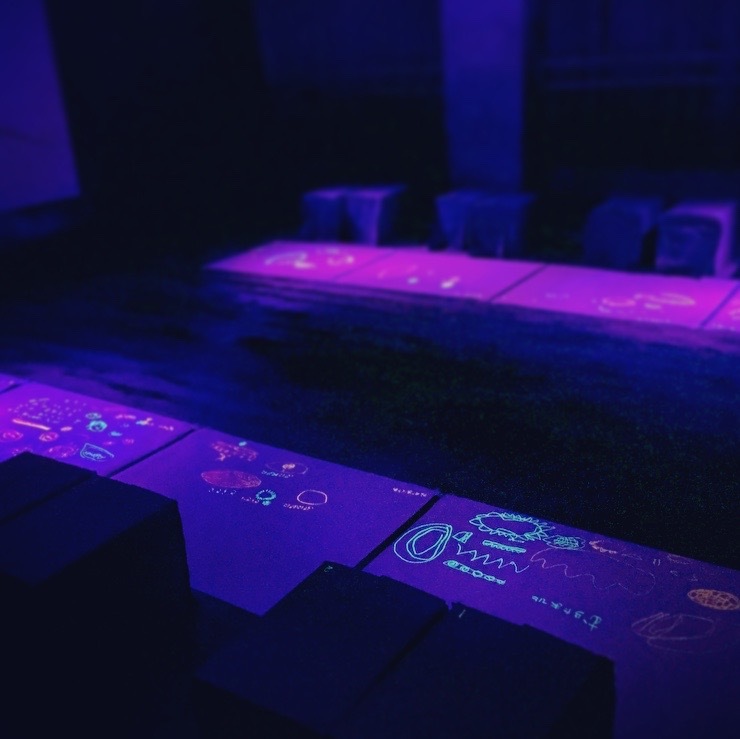 We invite you to contemplate the results of their resident productions during Dynamic Garden in Full Motion. 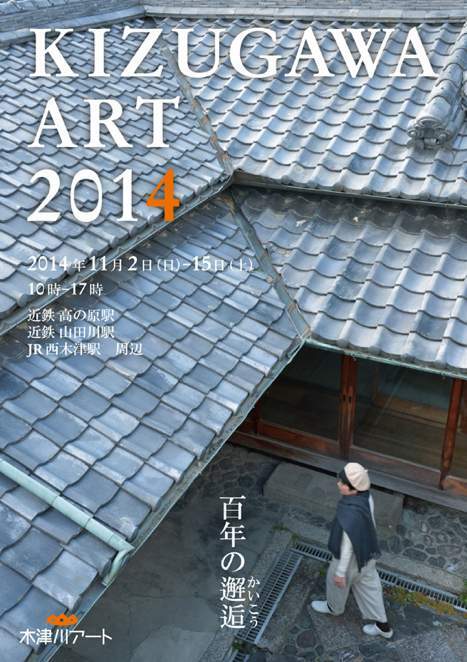 Organized by Aomori Contemporary Art Centre [ACAC], Aomori Public University. 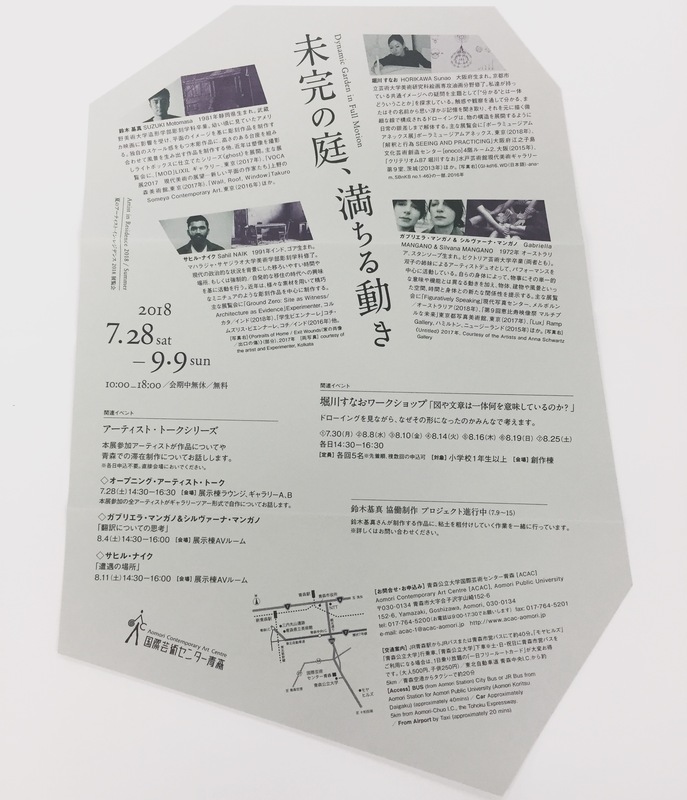 Supported by Khoj International Artists' Association, Aomori City Minami Junior High School, Aomori City Tsutsui Junior High School, Aomori Prefecture Aomori Wakaba School for Handicapped Student, Aomori Public University Art Club, AIRS. 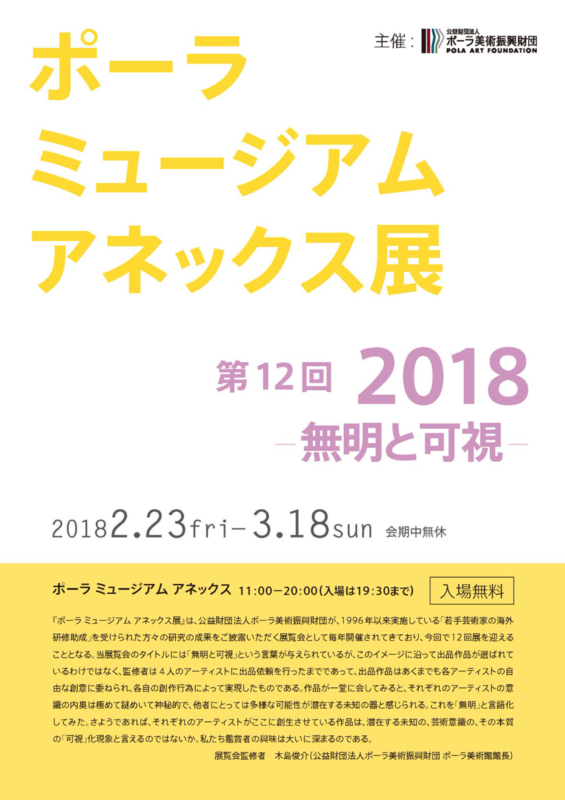 Sponsored by the Agency for Cultural Affairs Government of Japan in Fiscal Year 2018. 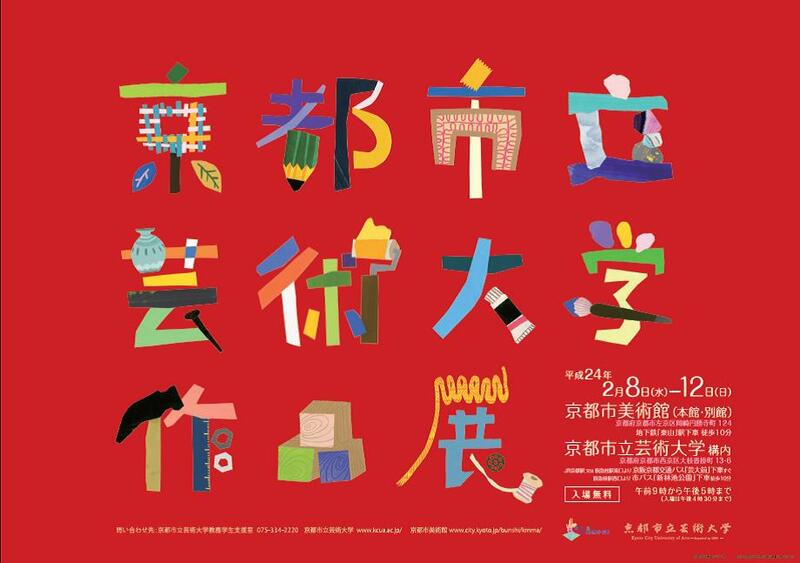 "Dynamic Garden in Full Motion"
The collaborative production is going today, too. 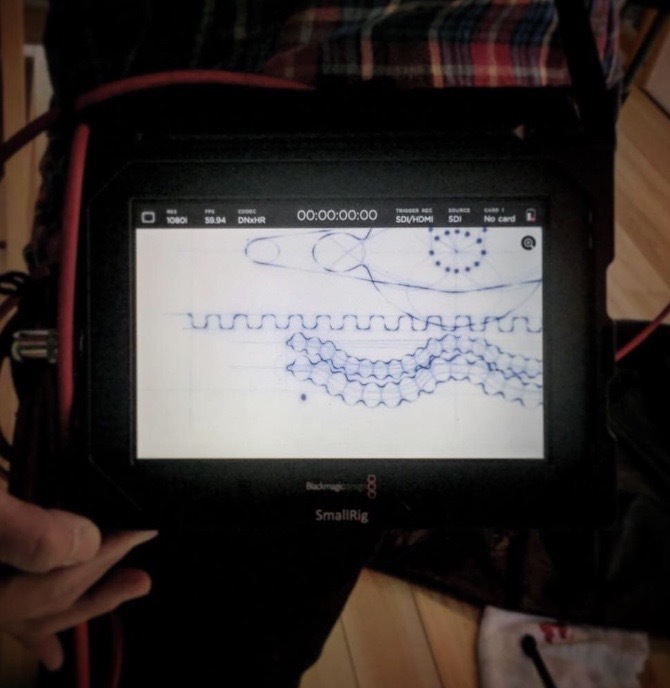 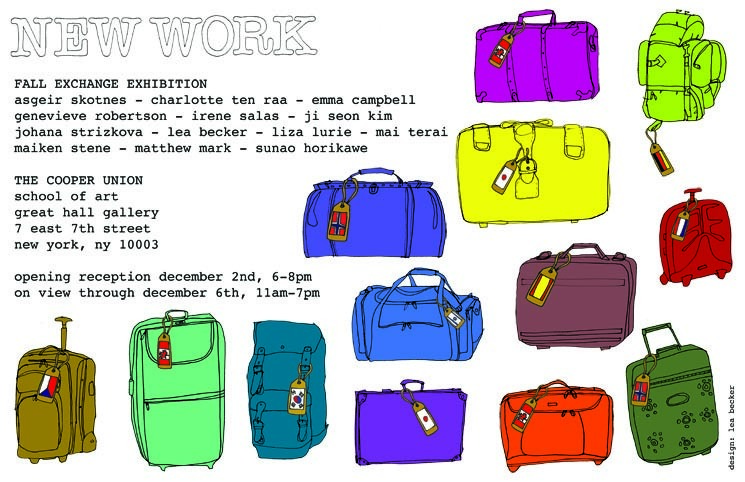 The collaborative production is going today, too. 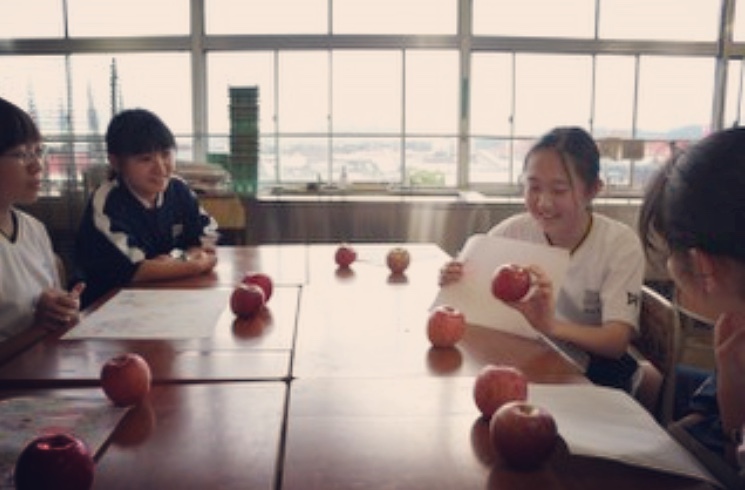 HORIKAWA Sunao asks many detailed question for 3 apples. 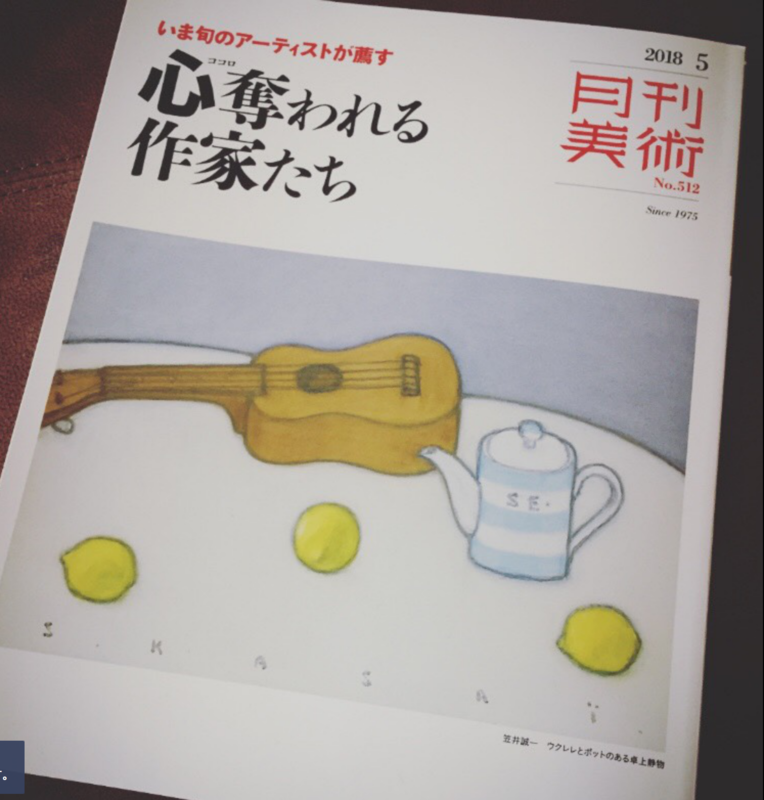 The photos were taken in today and last Wednesday, She did same thing for banana on Wednesday. 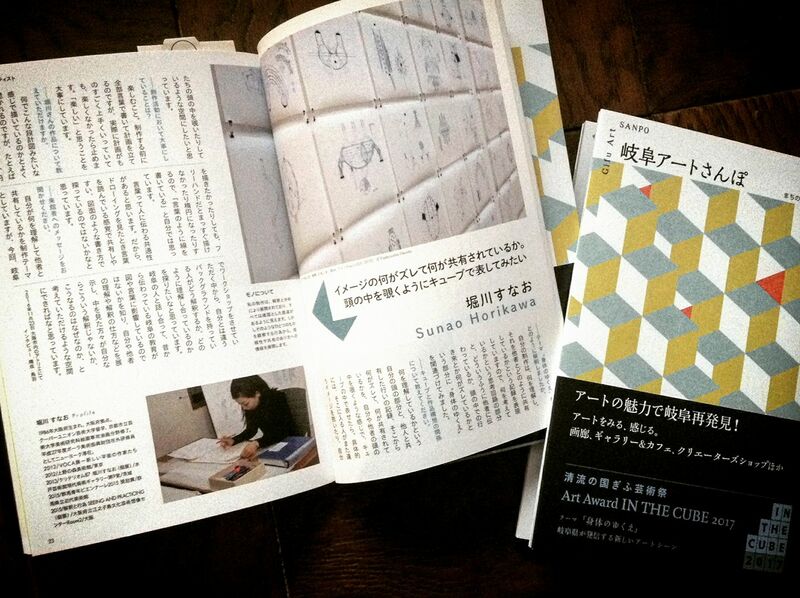 I am staying at The Aomori Contemporary Art Centre (ACAC) as Artist in Residence 2018 Summer Srtist for three months. 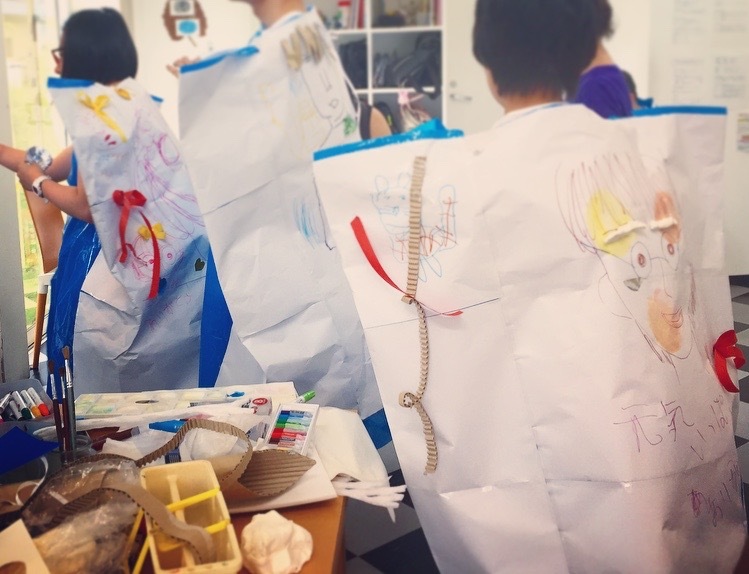 My art workshops ware held at an elementary school in East Osaka for my next public art work. 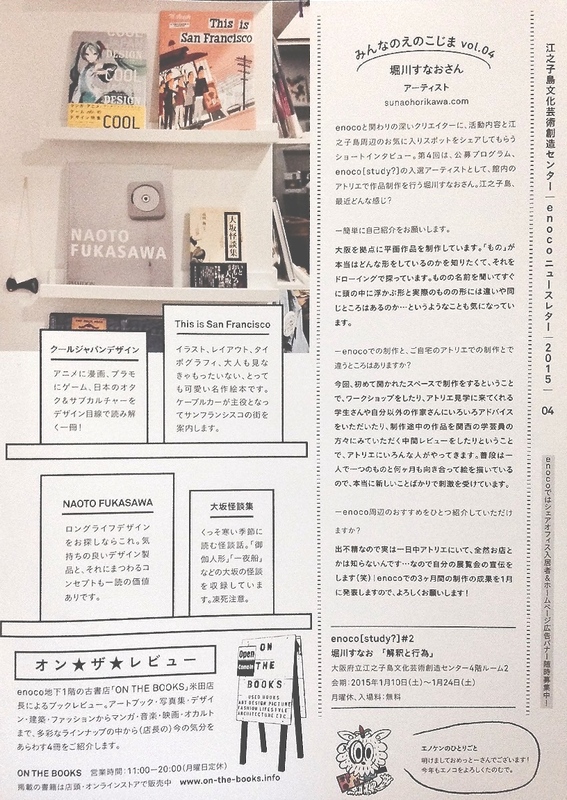 My art works was featured in a monthly magazine "GEKKAN BIJYUTSU" by Ms. Mai Miyake who is a contemporary visual artist. 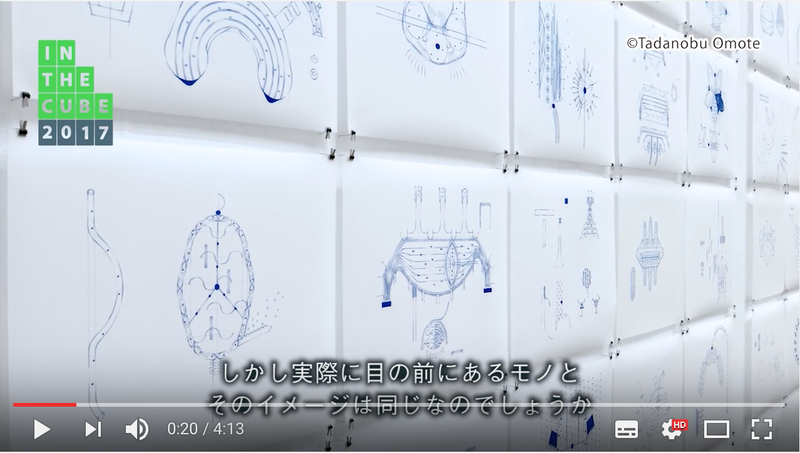 I and My art works will be on Japanese TV show "Ohayo Asahi Desu". 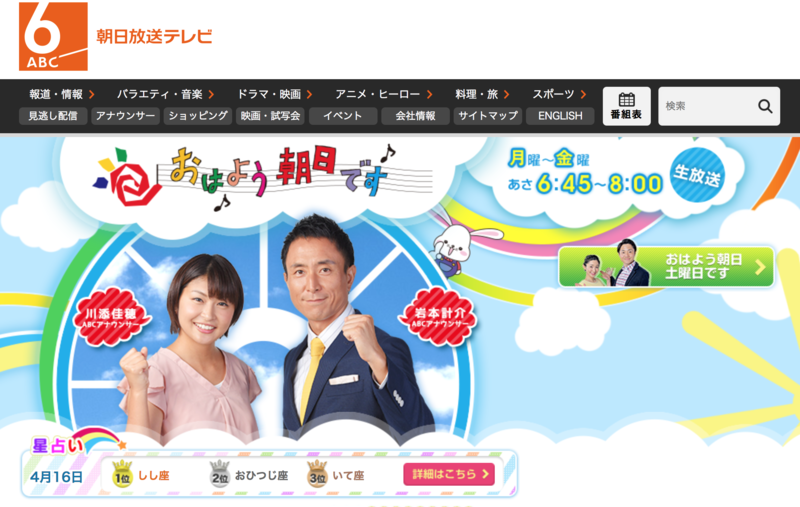 It is from 19th, April, 2018 7:20am! 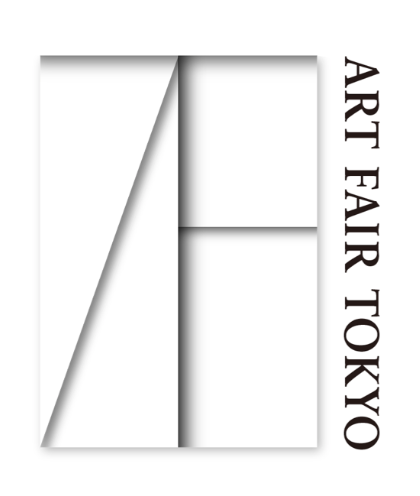 My art works will be Exhibited at ART FAIR TOKYO 2018. 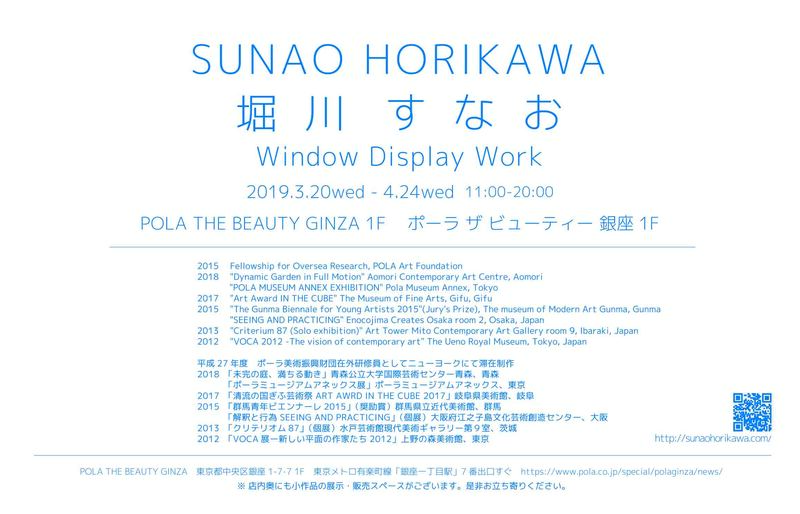 The exhibition booth is "S18 POLA ART FOUNDATION". 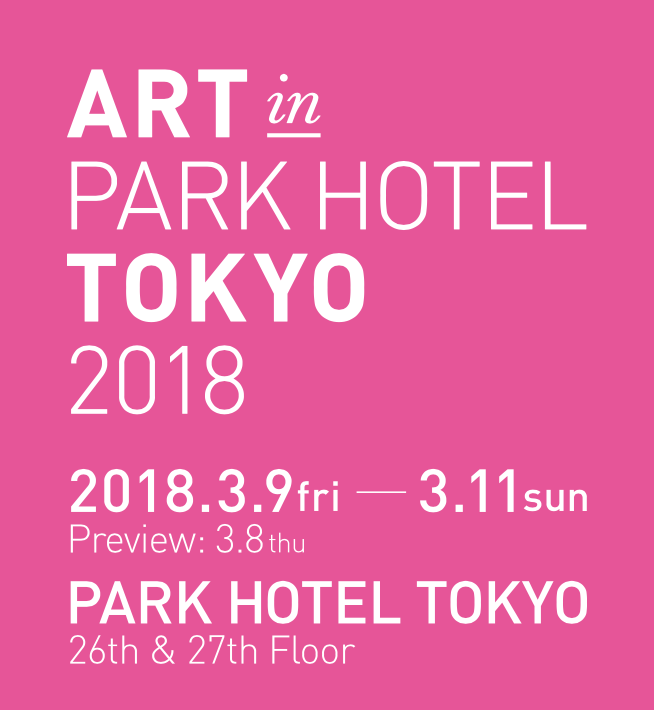 My art works will be exhibited in PARKHOTEL TOKYO 2018. 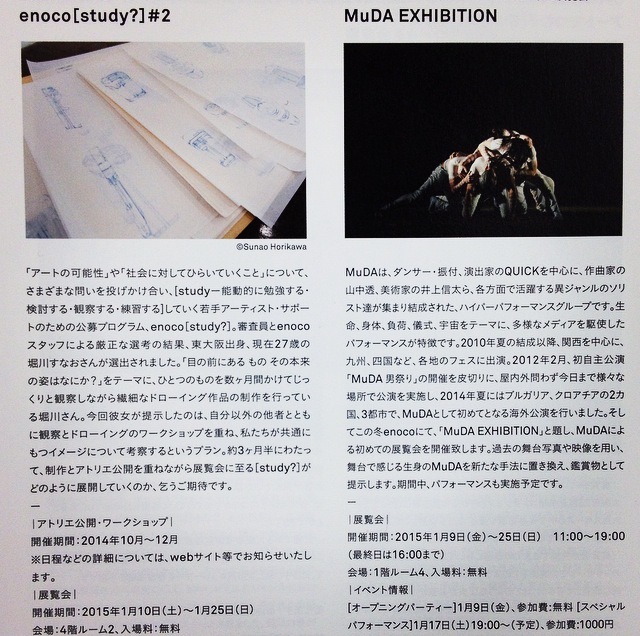 My group exhibition at POLA MUSEUM ANNEX. 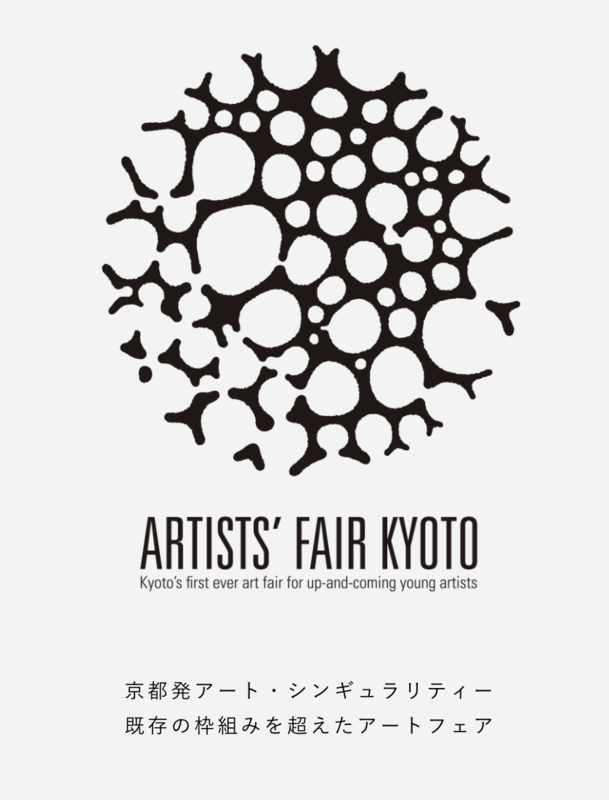 I will take part in Artists Fair Kyoto. 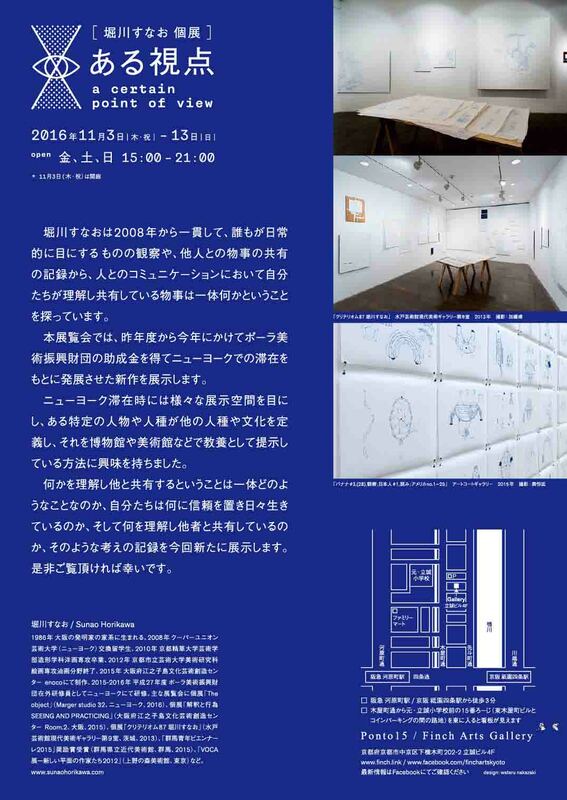 My group exhibition at Gallery The Youth - nishijin. 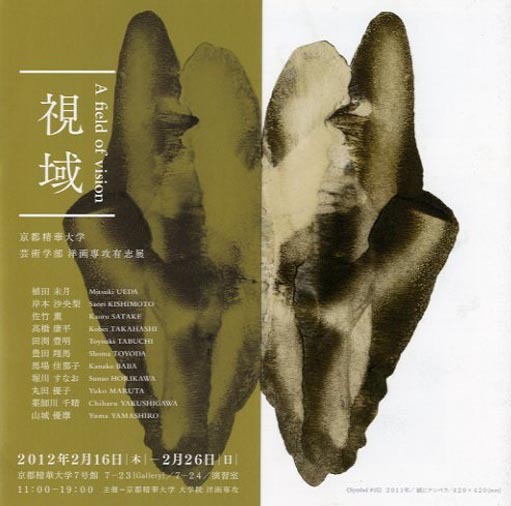 I'm going to exhibit my art works wit FINCH ARTS at "ART KAOHSIUNG" in Taiwan. 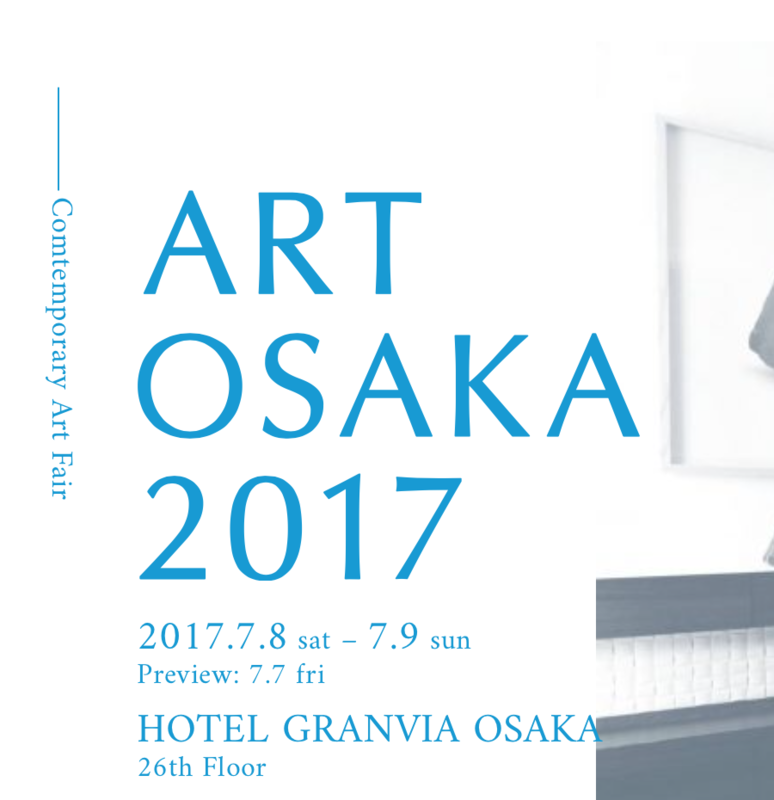 ART OSAKA 2017 will be held on the weekend of July 8th and 9th (preview on July 7th) on the 26th floor, Hotel Granvia Osaka. 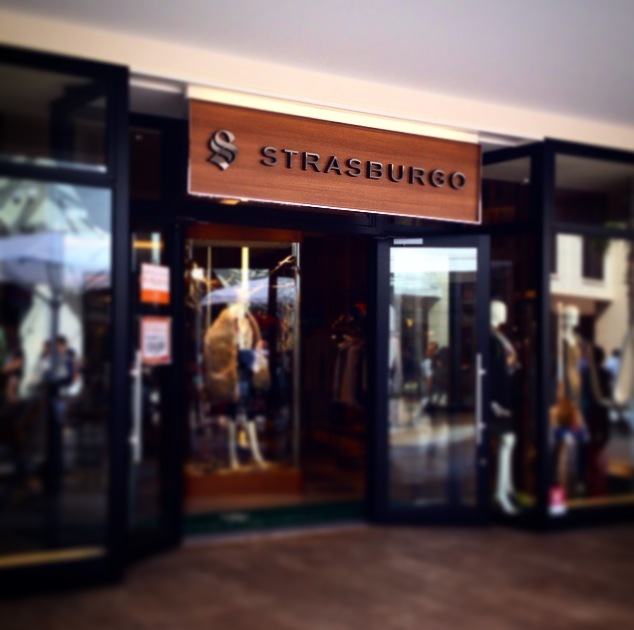 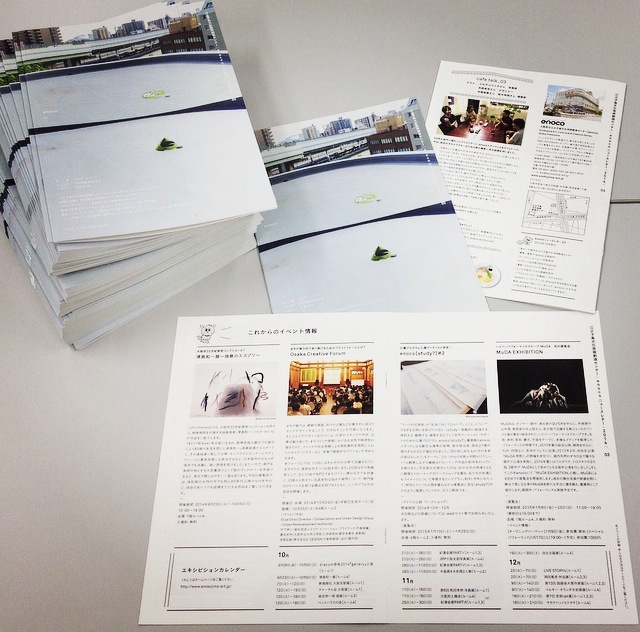 The venue is directly accessible from JR Osaka station. 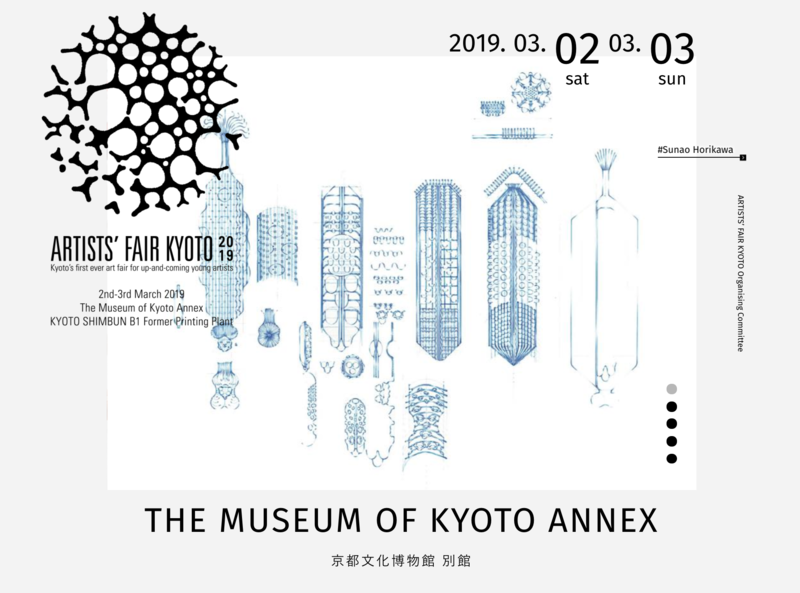 * Admission closes 1hour prior to the fair closing. 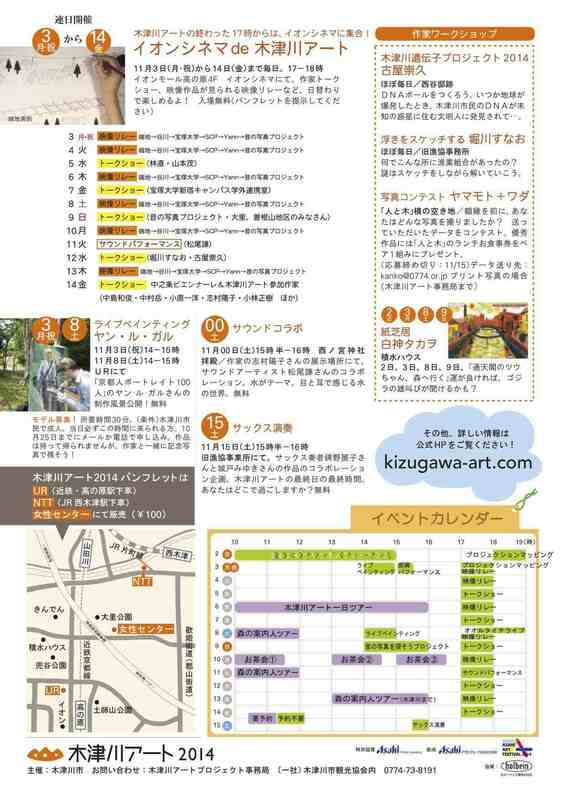 *Admission free for children under 12 years old, with being accompanied by responsible adults. 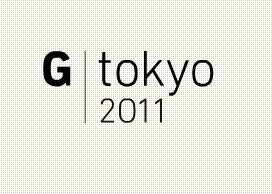 *Please purchase tickets at the reception desk at Hotel Granvia Osaka. 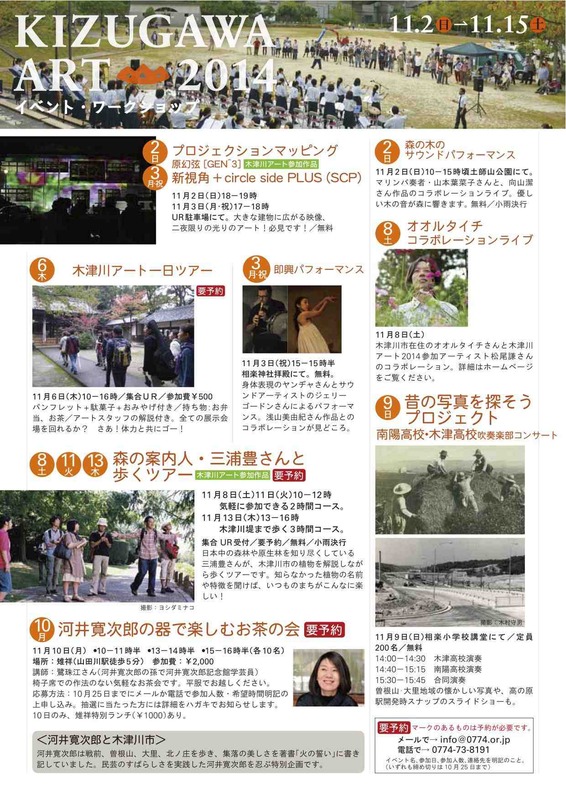 10th,MAY,2016 My group exhibition was featured in Mainichi news paper by Emiko Yoshioka. 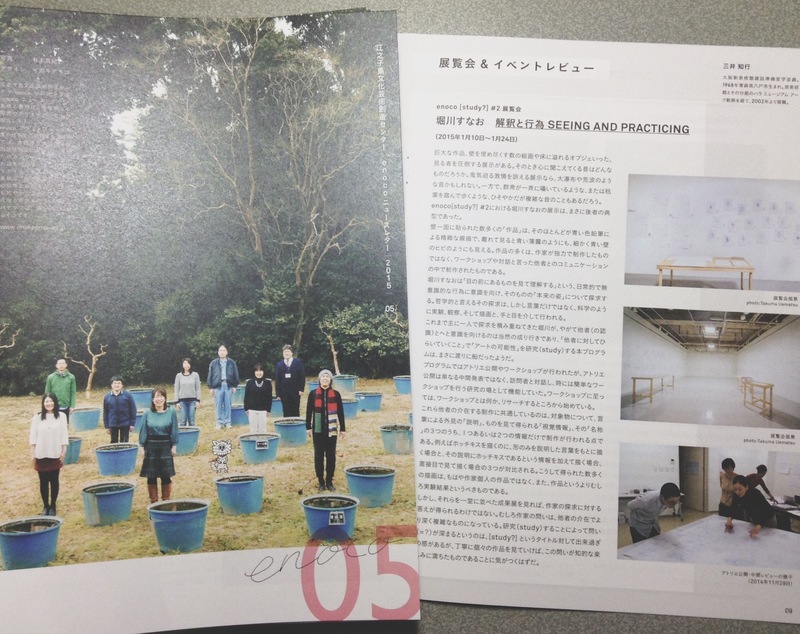 My group exhobition was featured in a book about the Arts in Gifu prefecture. 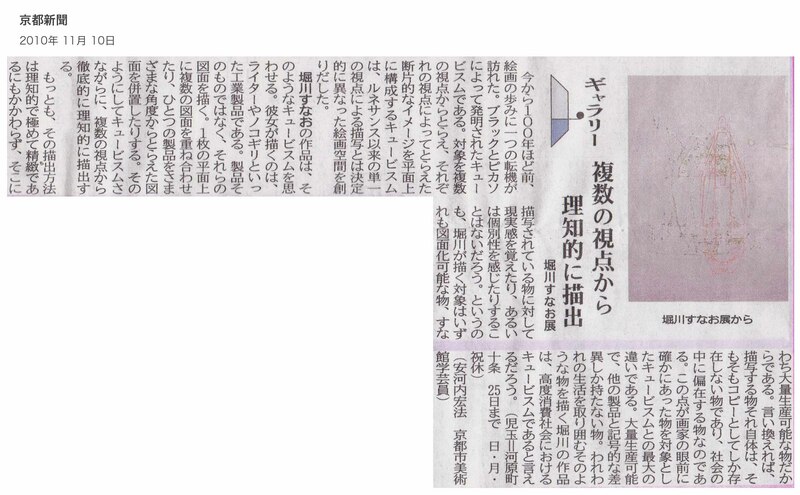 Theme for the 1st installment:"Whereabouts of the Body"
18th,Dec,2016 AAIC pre-event came out in "The Chunichi Shimbun" Japanese news paper. 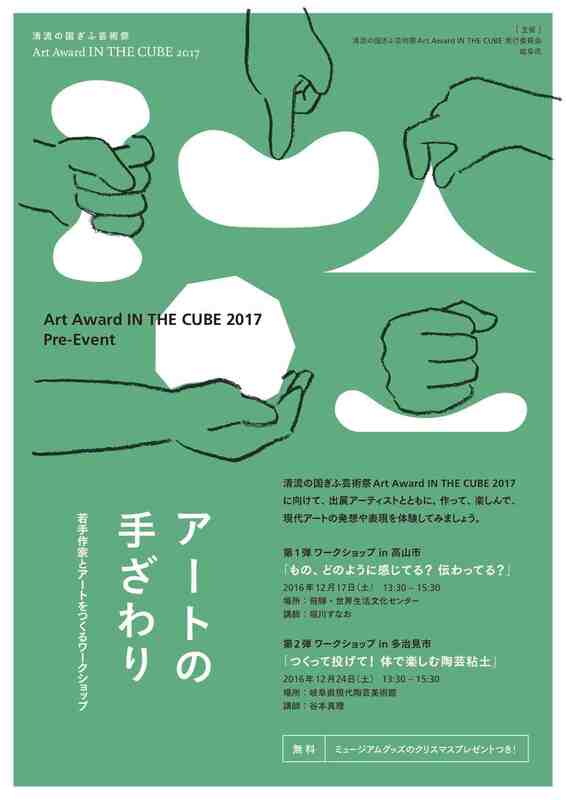 Sunao Horikawa gives a workshop at HIDA Earth Wisdom Center as a pre-event of "Art Award IN THE CUBE" at The Museum of Fine Art, Gifu. 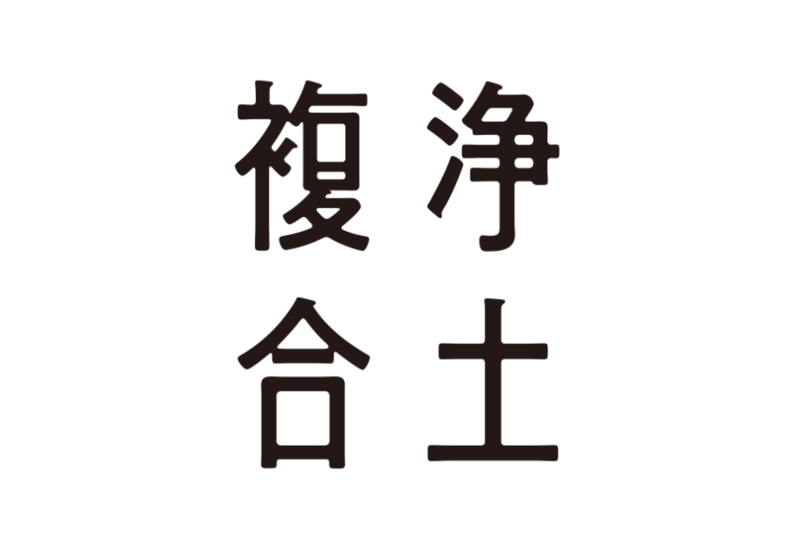 "PUT YOUR HANDS UP! 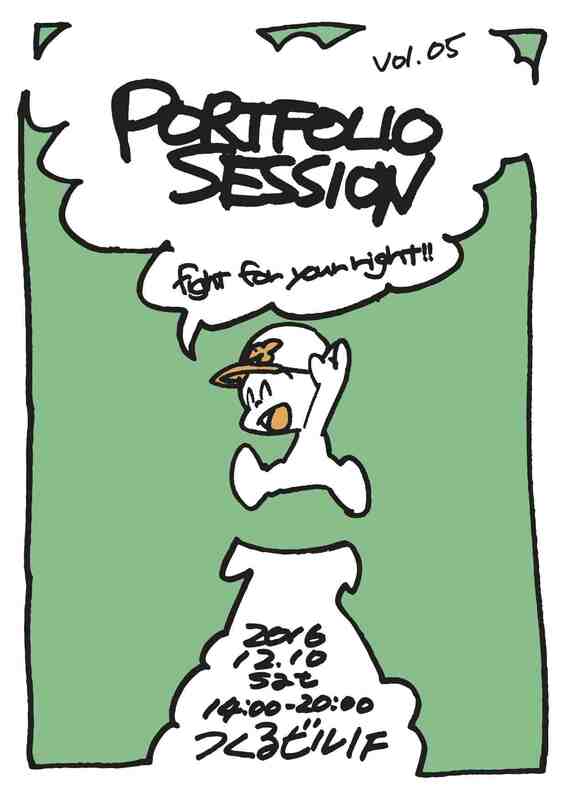 PORTFOLIO SESSION!!" 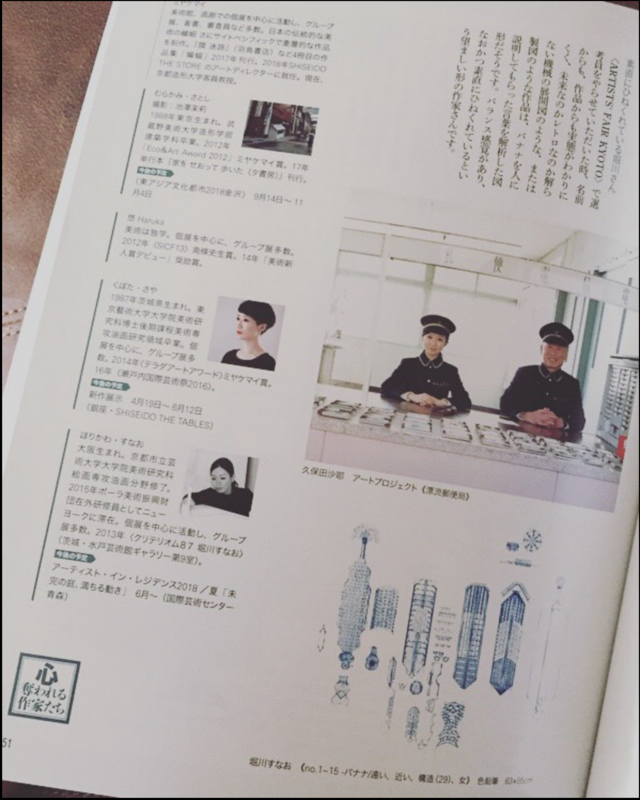 I was featured in a Japanese magazine "Meets regional"
Every year Kyoto city university of Arts has an exhibition "SAKUHINCHI!" 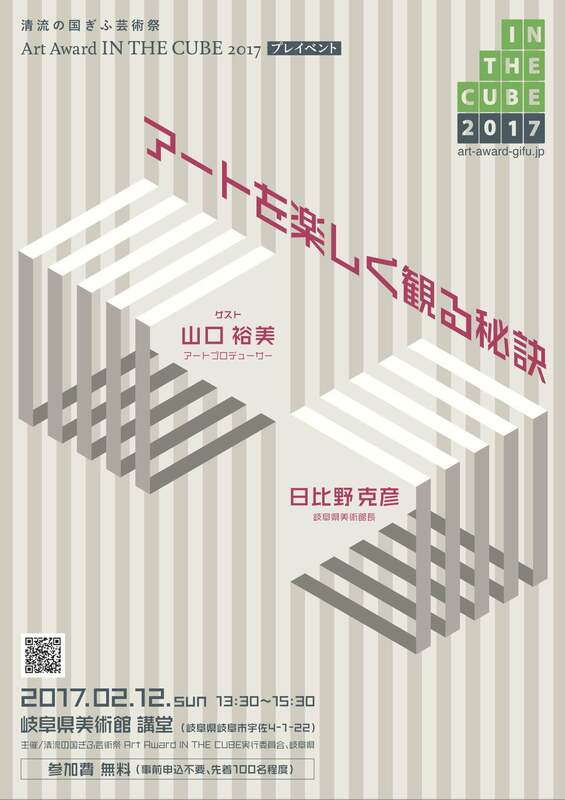 in which some post graduated students with major in painting are selected to exhibit same time as graduation exhibition. 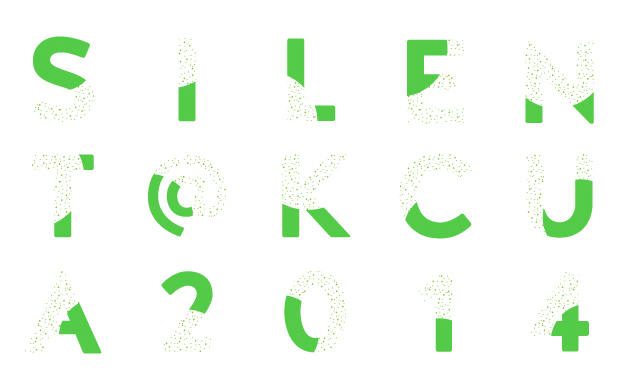 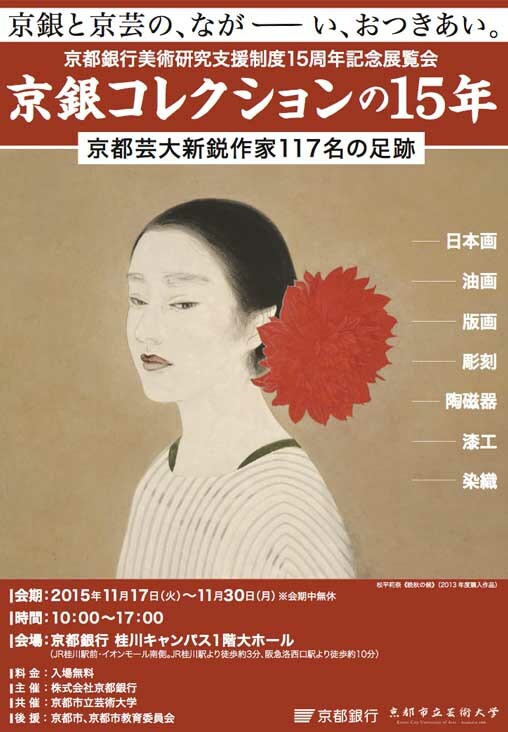 This year 8 artists who were selected from 2007 to 2015, are going to exhibit at the same time. 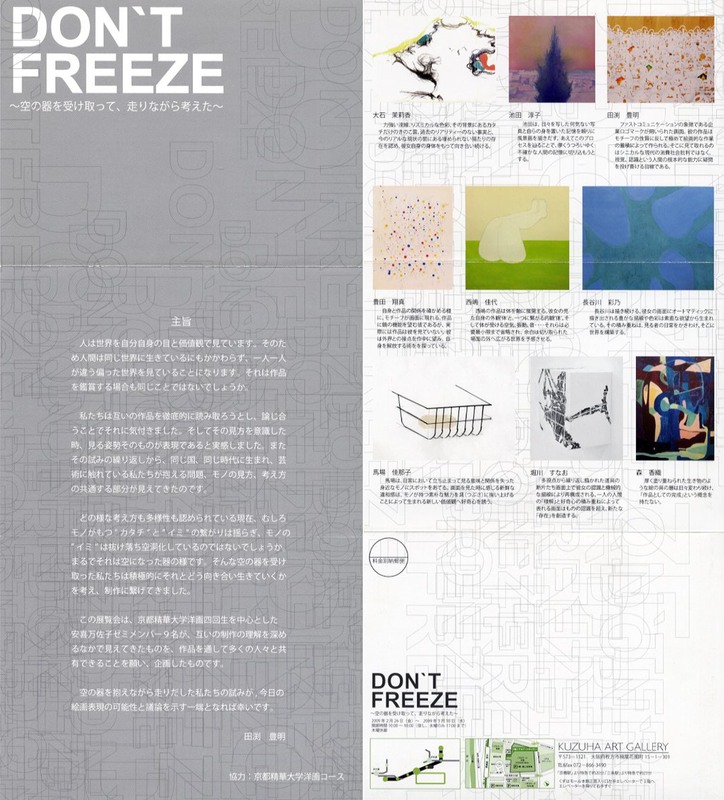 You will be able to enjoy the work of artists who already graduated the University. 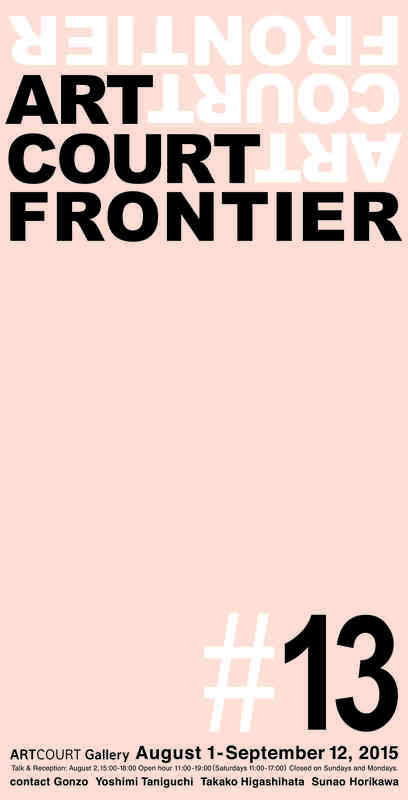 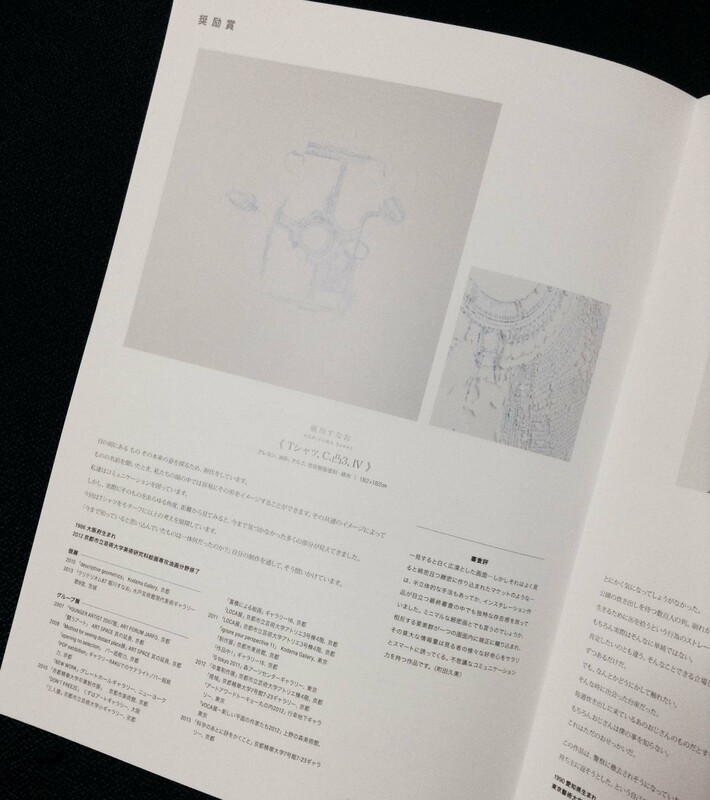 The catalogue of my last group exhibition "Art Court Frontier 2015 #3", I was selected by Emiko Yoshioka who is an independent curator. 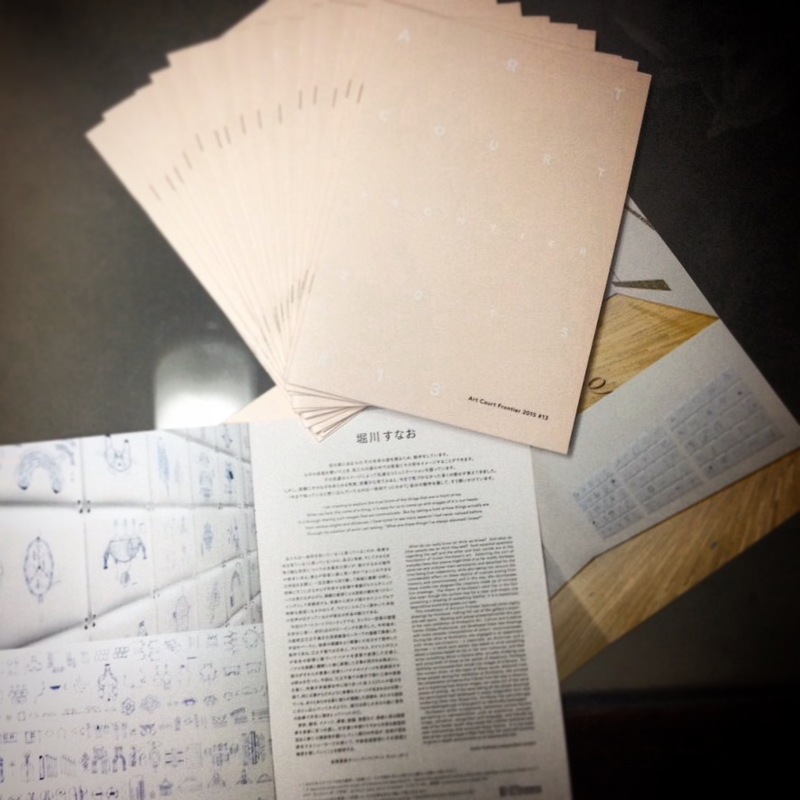 She wrote the sentences about my works. 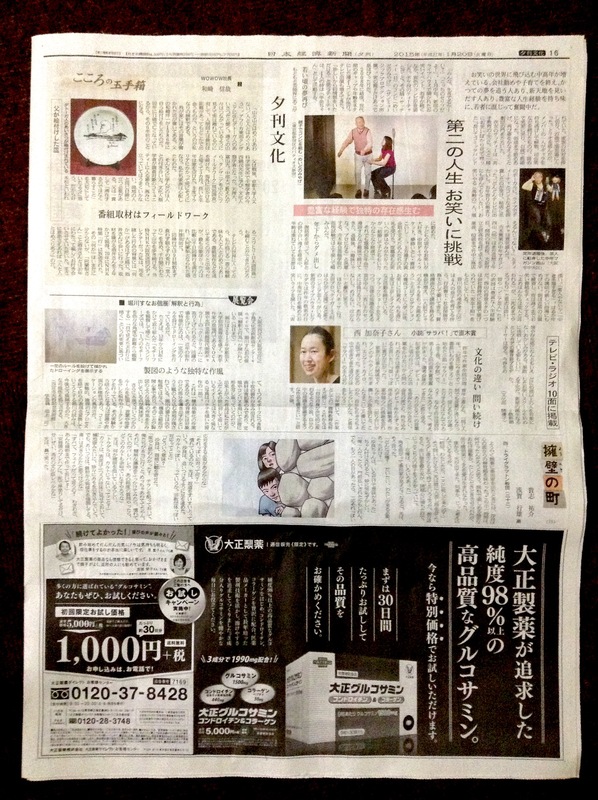 If you have time please see it. 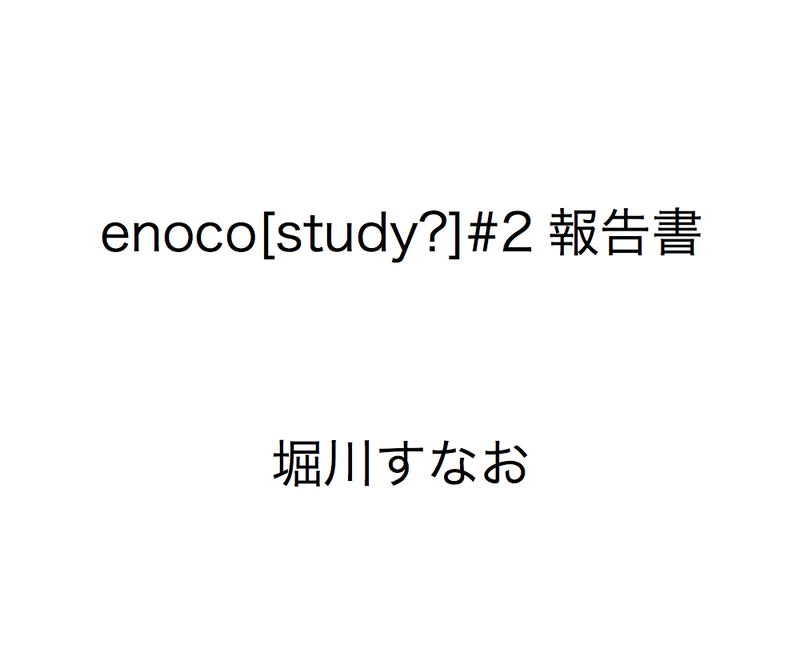 My last residency program was featured in a magazine of enoco as "enoco study?#2 in Sunao Horikawa's case". 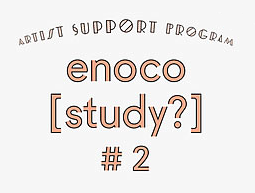 Every year enoco(enokojima create Osaka) select an artist for their residency program. 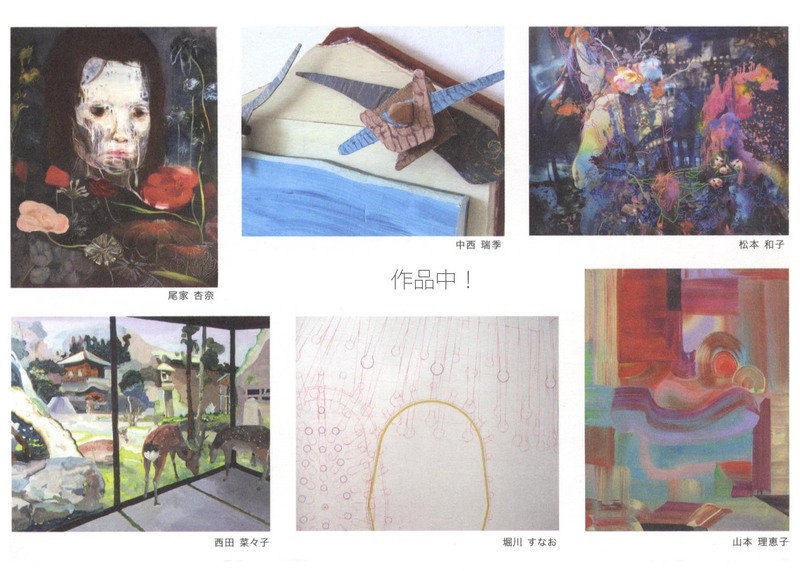 I was a second artist in 2014. 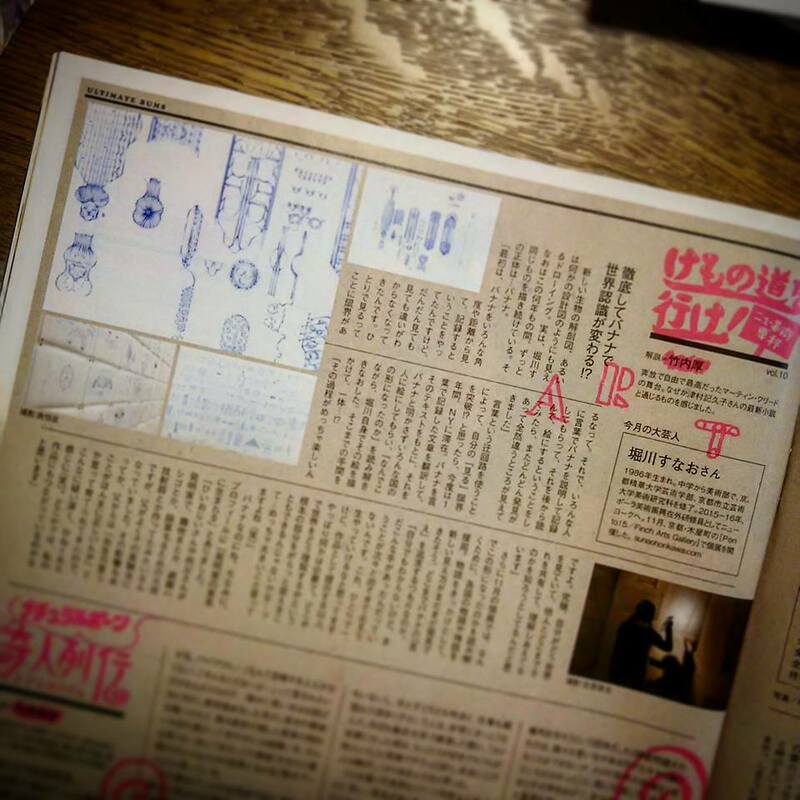 9th,Sep,2015 My group exhibition was featured in Mainichi news paper by Yuka Shimizu. 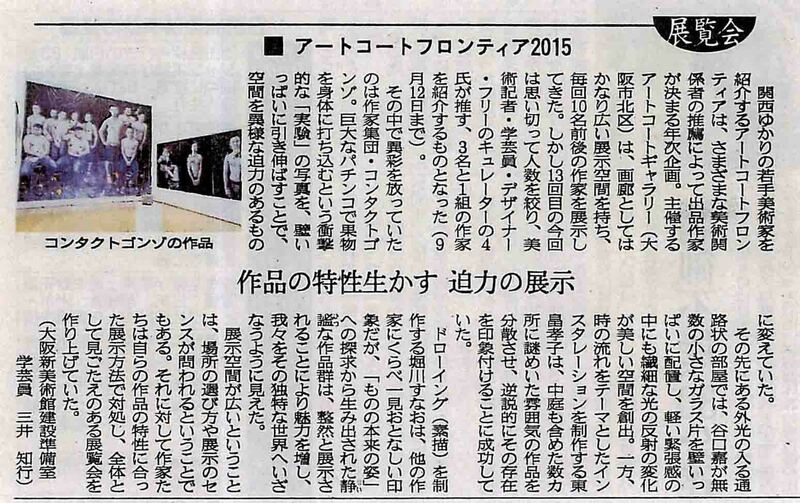 12th,Aug,2015 My group exhibition was featured in Mainichi news paper by Yuka Shimizu. 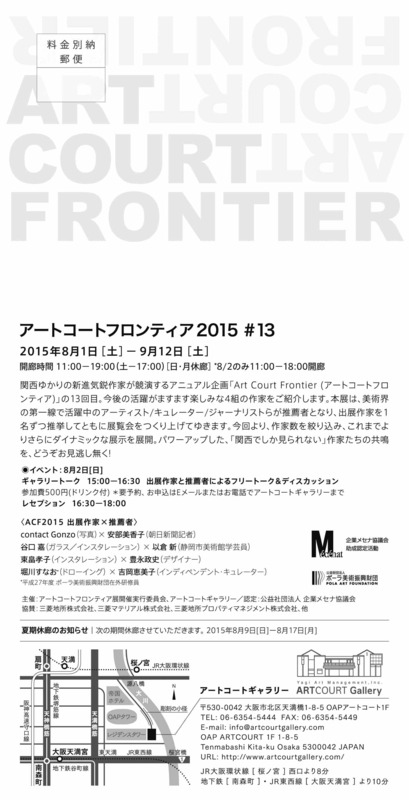 "Art Court Frontier" exhibition has continued from 2003, once a year, in east Japan, Osaka. 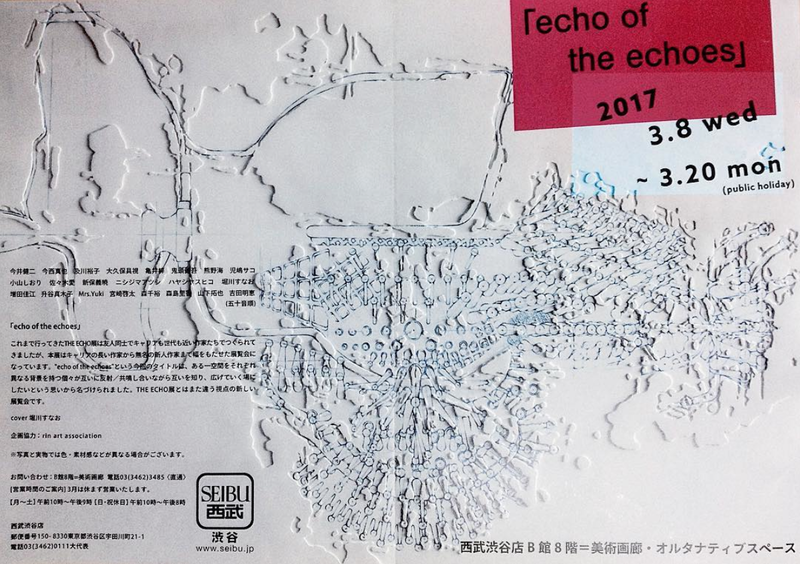 This exhibition is held by 4 young artists who are related to east Japan and are recommended by curator, artist, journalist and critic. 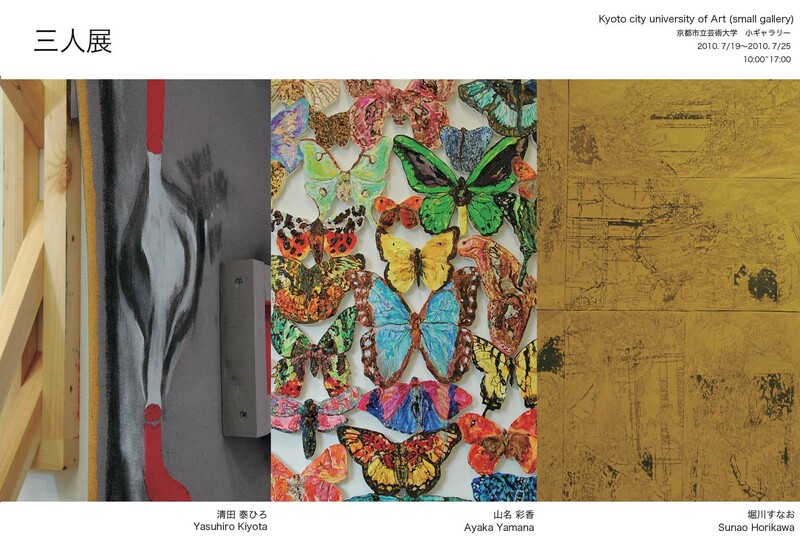 Don't miss "East Japan now" from the artists who are looking forward to their future success. 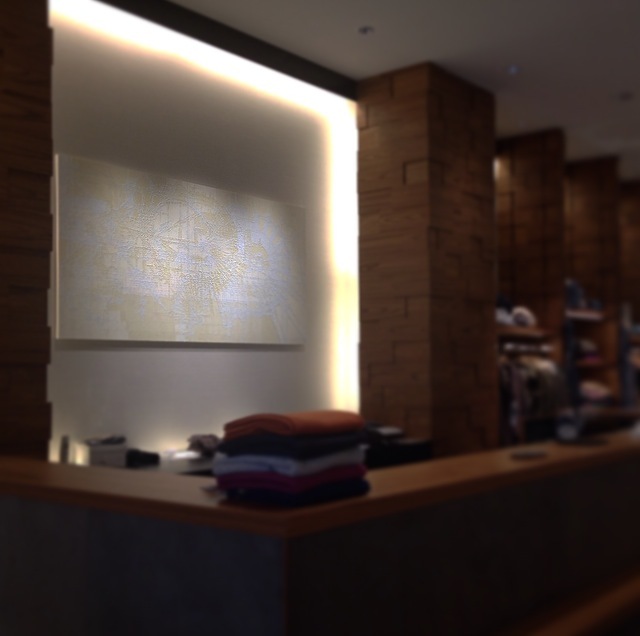 Closed on Sundays, Mondays, national holidays and 8.9[sun] - 8.17[mon]. 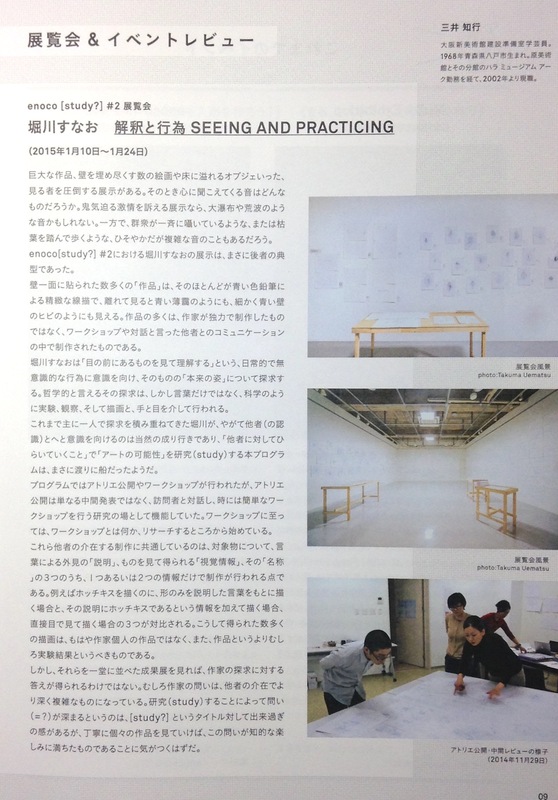 My last solo exhibition was featured in a magazine of Enokojima Art Culture and Creativety Center Osaka Prefecture by Tomoyuki mitsui who is a Curator at Osaka City Museum of Modern Art. 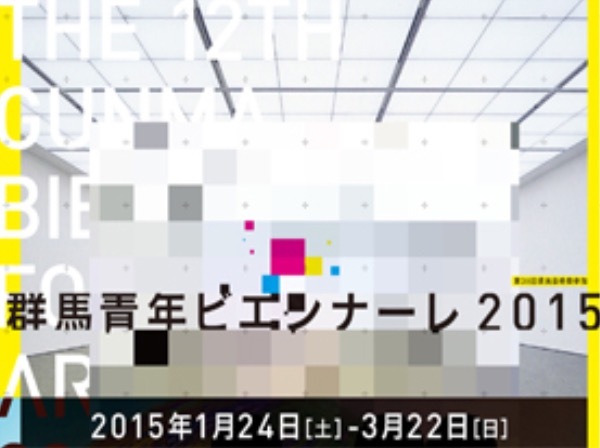 I was selected as an Oversea Research of POLA Art Foundation 2015. 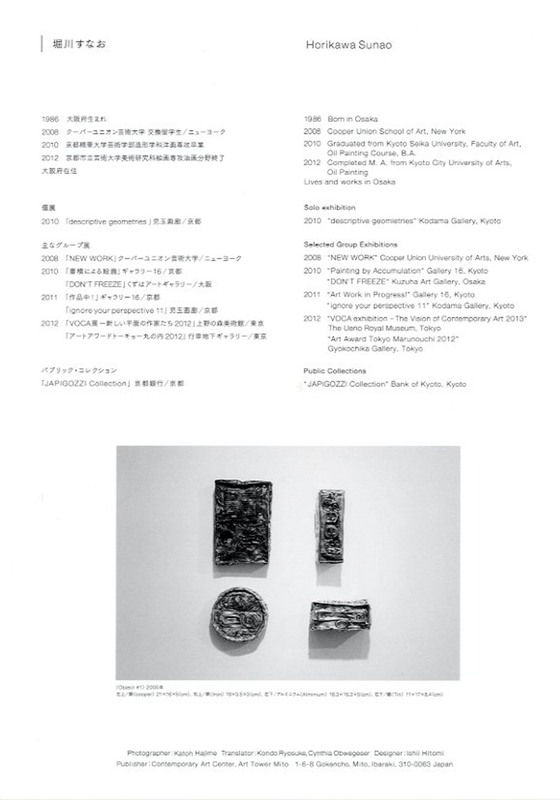 I am researching my theme in New York from Jun,2015 to Jun 2016. 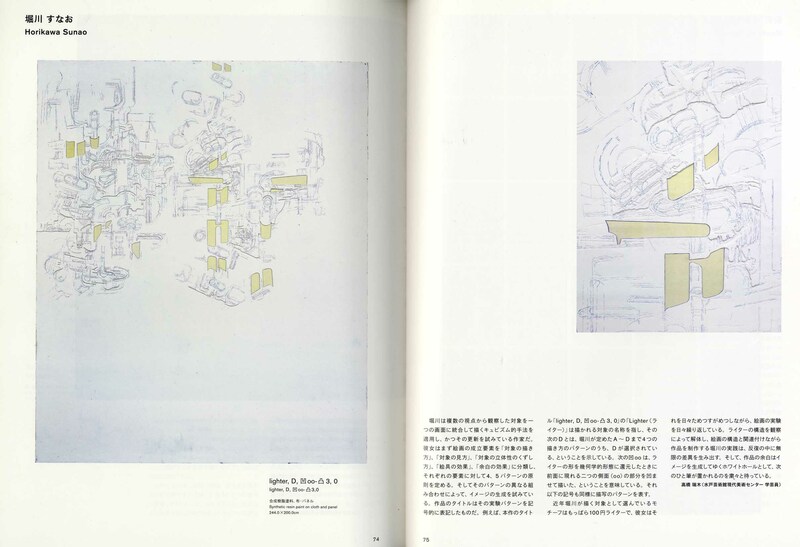 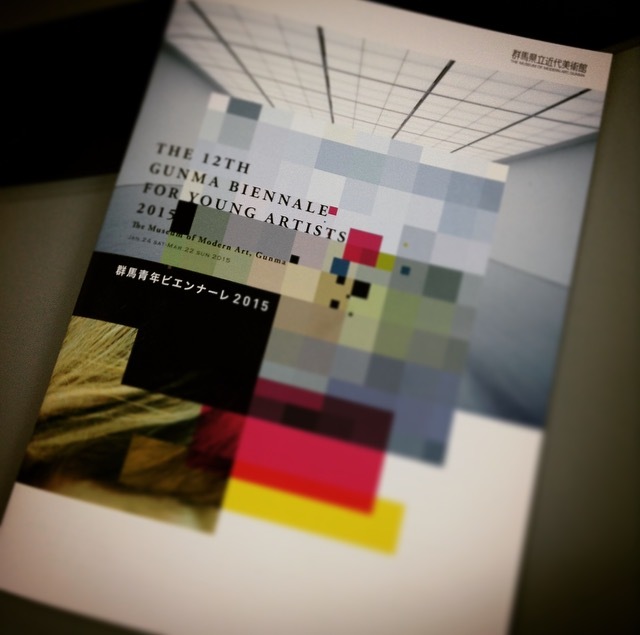 My art work was featured in a book of "The Gunma Biennale for Young Artists 2015" by Kumi Machida. 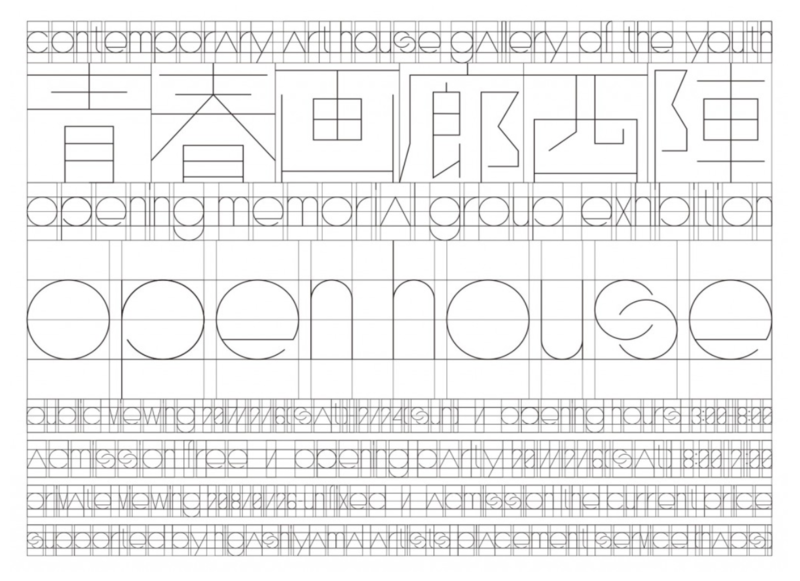 May be temporarily closed for exhibition changes and other reasons. 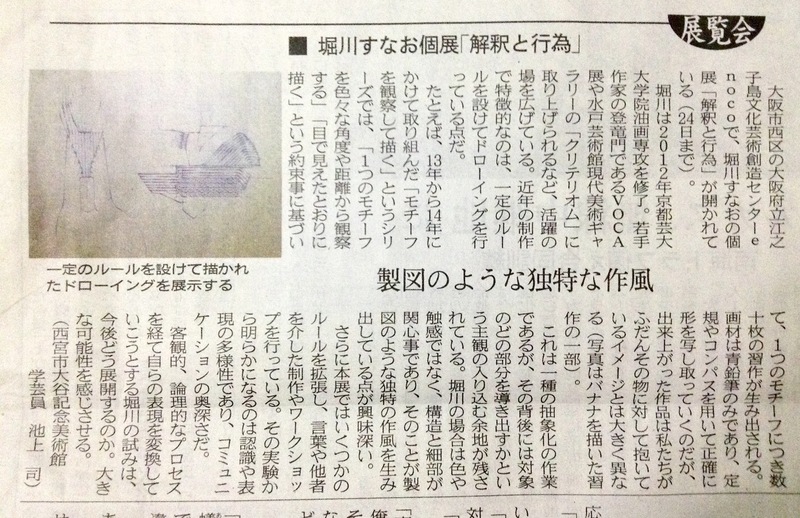 20th,Jan,2015 My solo exhibition was featured in Nikkei news paper by Tsukasa Ikegami who is a Curator at OTANI MEMORIAL ART MUSEUM,NISHINOMIYA CITY. 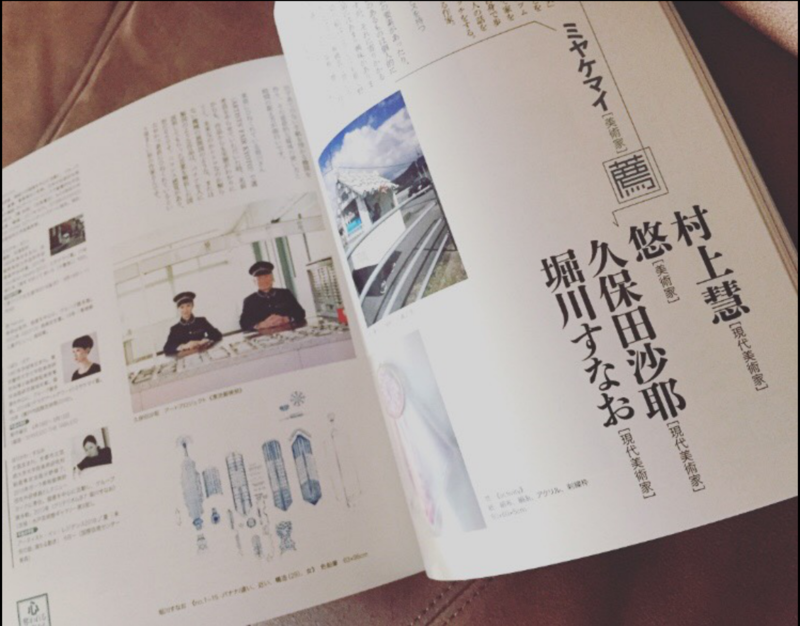 "What are the reality of things that are in front of our eyes?" 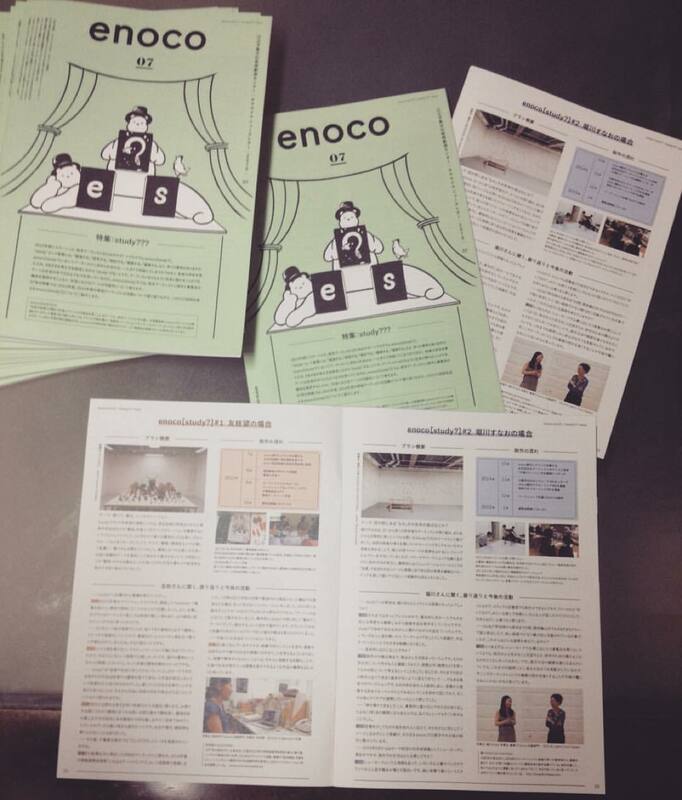 For three months from August,2014 Sunao Horikawa produced her art works through a lot of careful examination under workshops with people of various age at ENOCO. 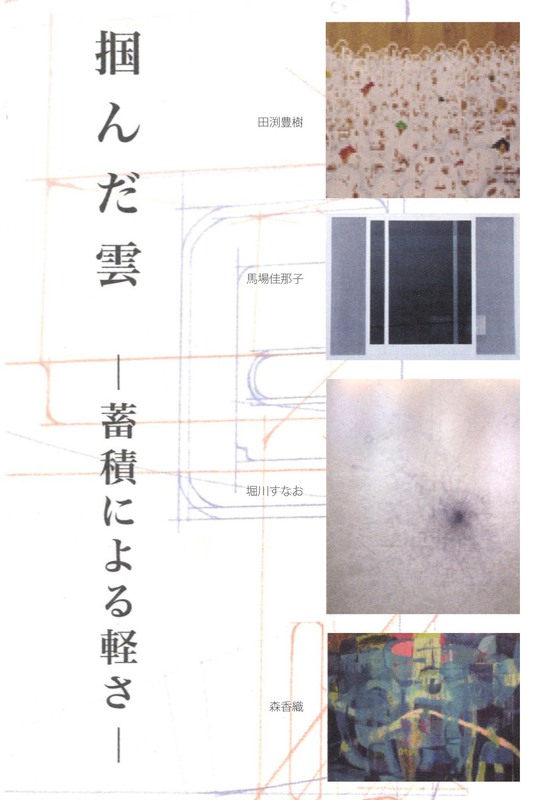 She recorded her experiments and analysis about the defference between our senses and imagination. 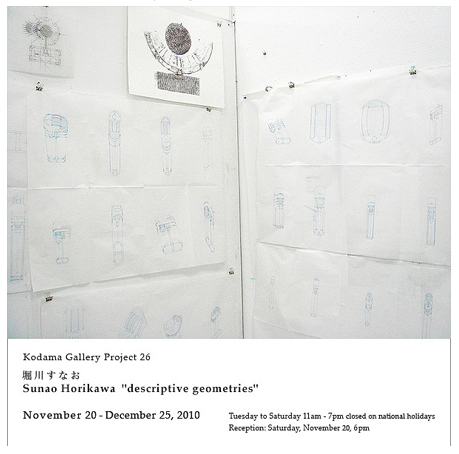 At this exhibition she will propose how to change her art works after taking in other people's view points. 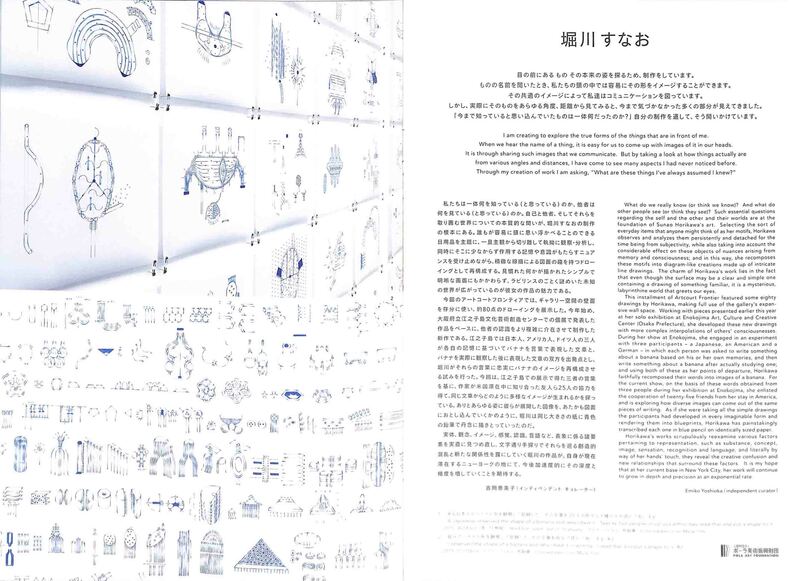 Sunao Horikawa researched about our deferent way of seeing and recognizing objects trough her workshops with various age people based on "What are the reality of things that are in front of our eyes?". 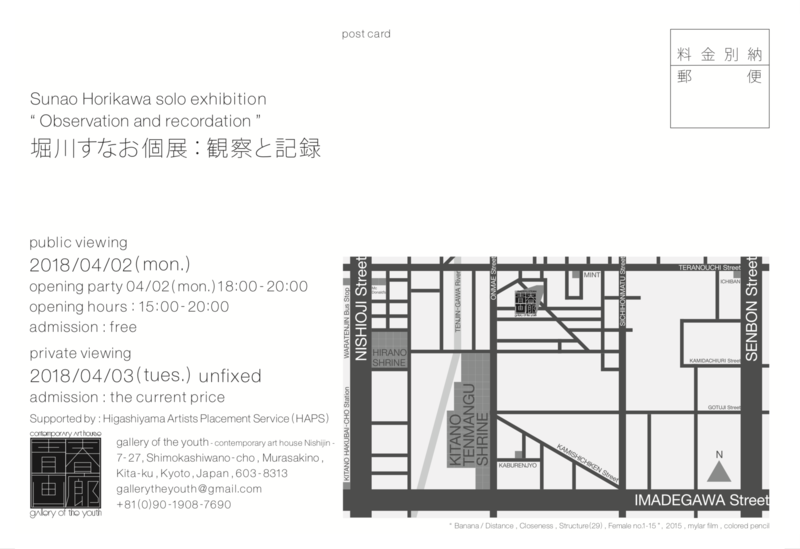 At the preview and open studio, Please see processes and records of workshops and a planning of exhibition. 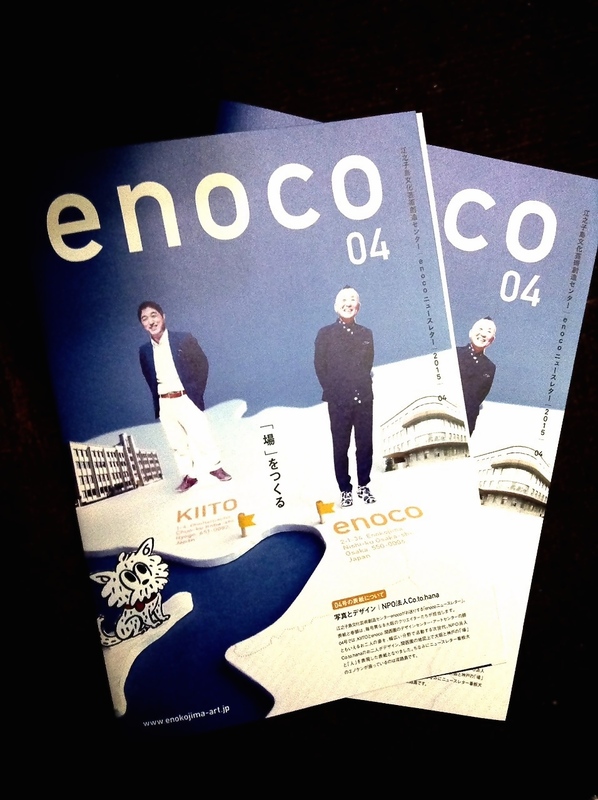 I was selected as an artist of enoco[stusy?]#2. 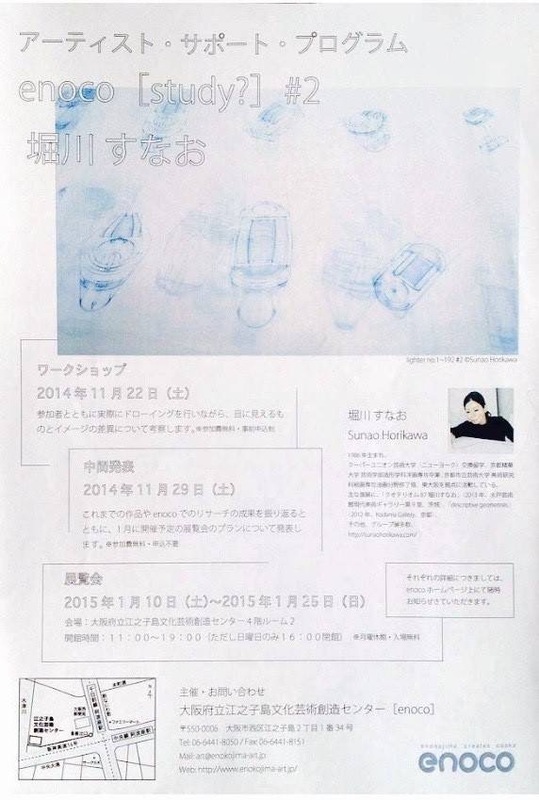 I will make my works at enokojima creates osaka from October to November,2014. 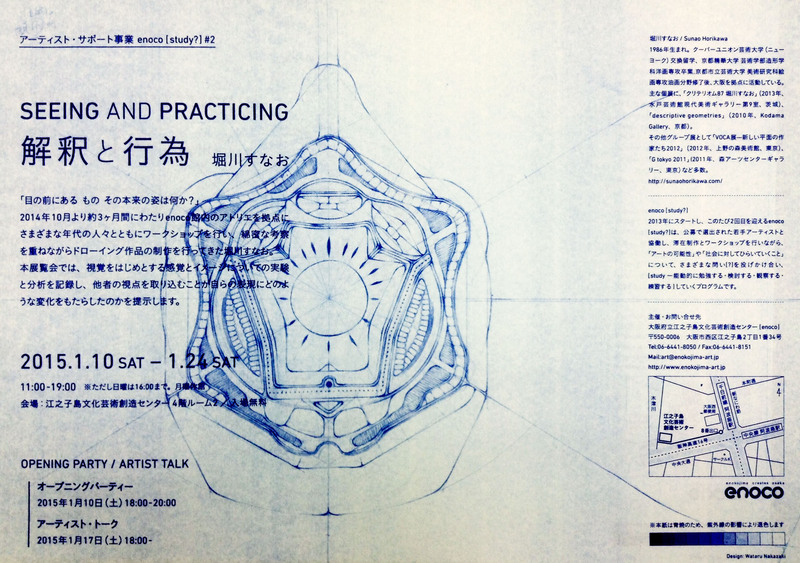 During this period I am planning to hold several workshops and an open studio. 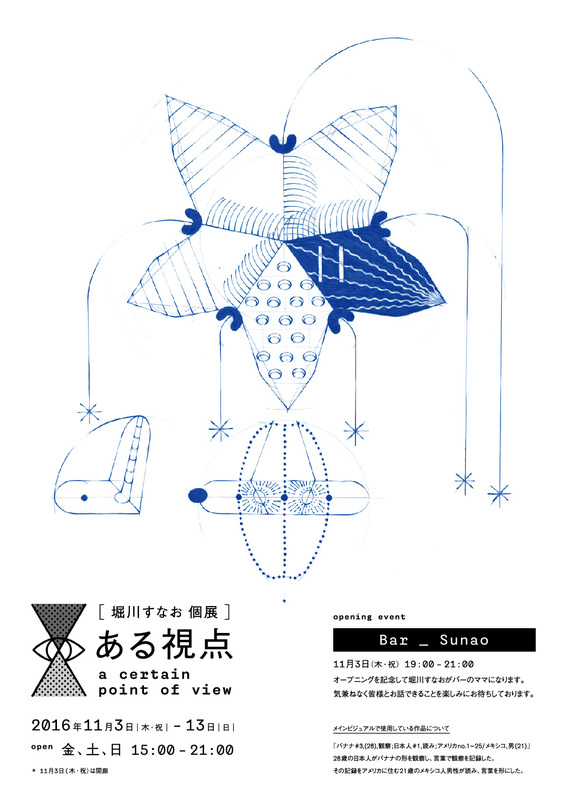 In January 2015 I will have a exhibition at enocjima creates osaka. 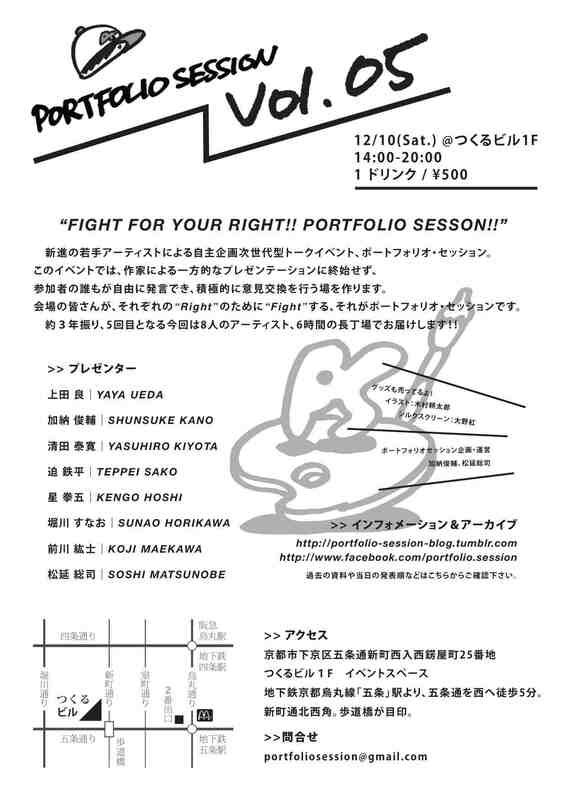 12,Nov(tue) 17:00-18:00 at AEON MALL Takanohara 4F AEON CINEMA. 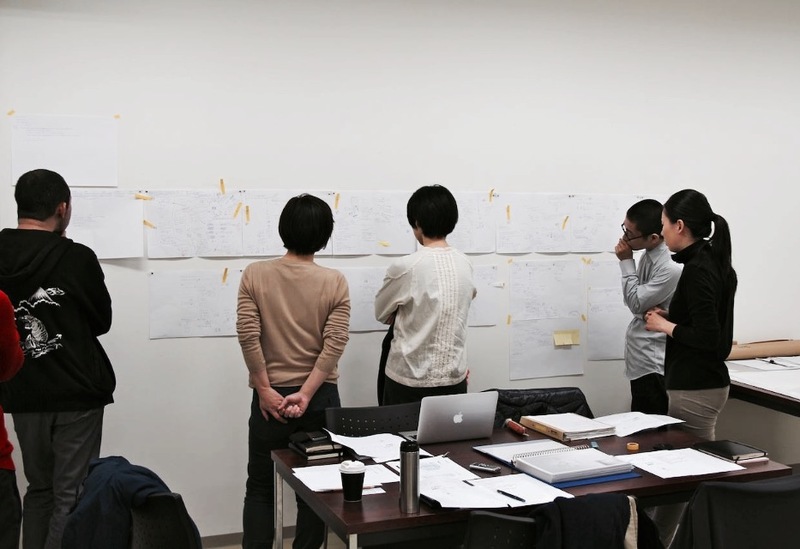 Almost everyday at Kyugyogyoukumiai(an old fishing cooperative office). 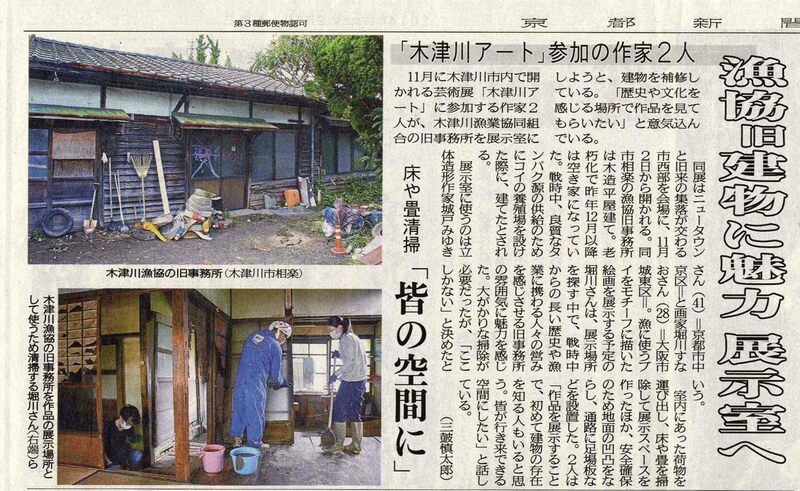 My next exhibition place "An old fishing cooperative office of KIZUGAWA ART 2014" was reported by Kyoto shinbun(news paper in Kyoto). 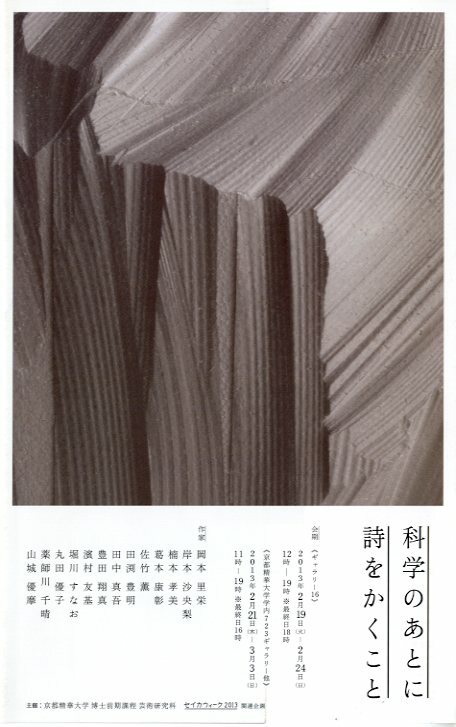 Sunao Horikawa is has executed experimental still-life painting with different techniques. 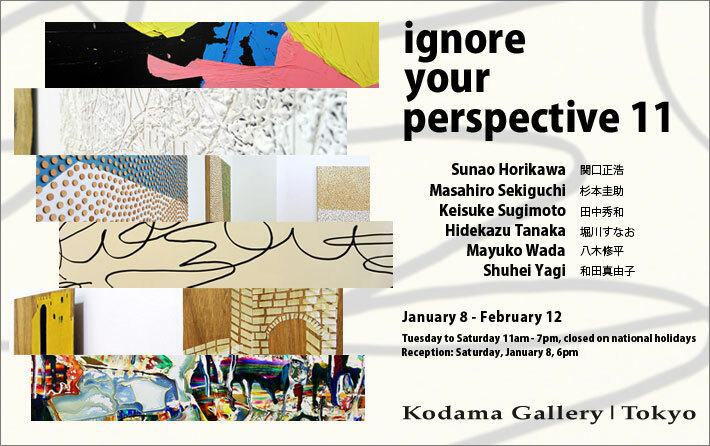 In this exhibition Horikawa will introduce her various experimental works from old to new in order to see possibility of contemporary painting. 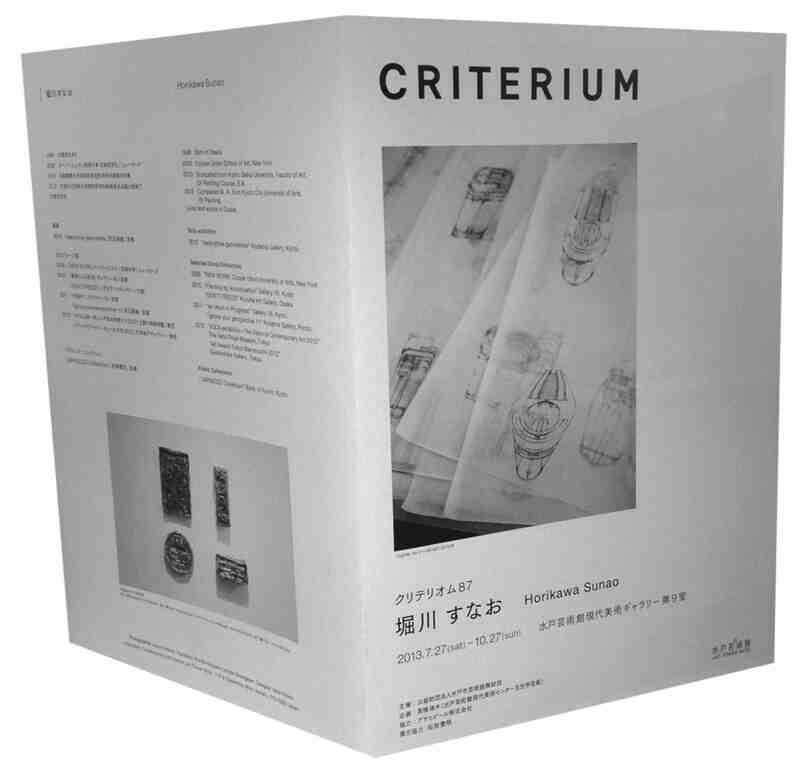 Fee : Included in the admission to the special exhibition. 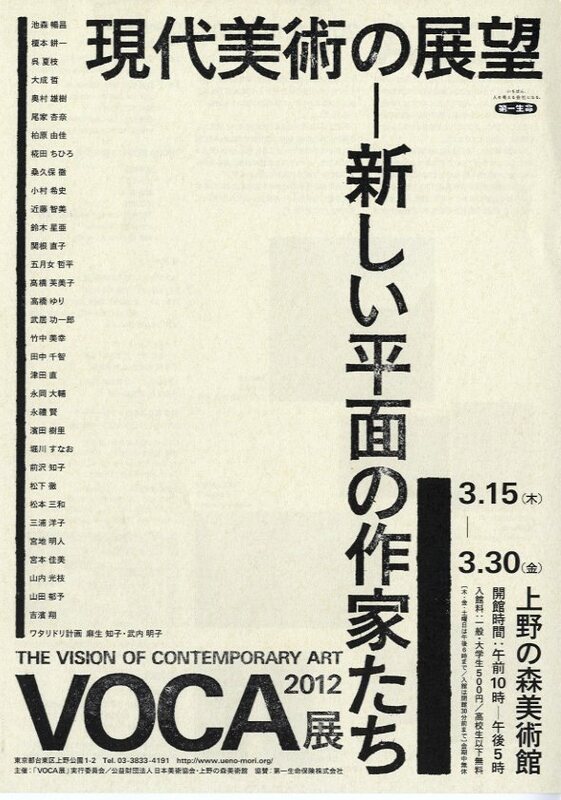 My art work was featured in book of "The Vision of Contemporary Art 2012" by Mizuki Takahashi who is a Senior Curator at Contemporary Art Center, Art Tower Mito. 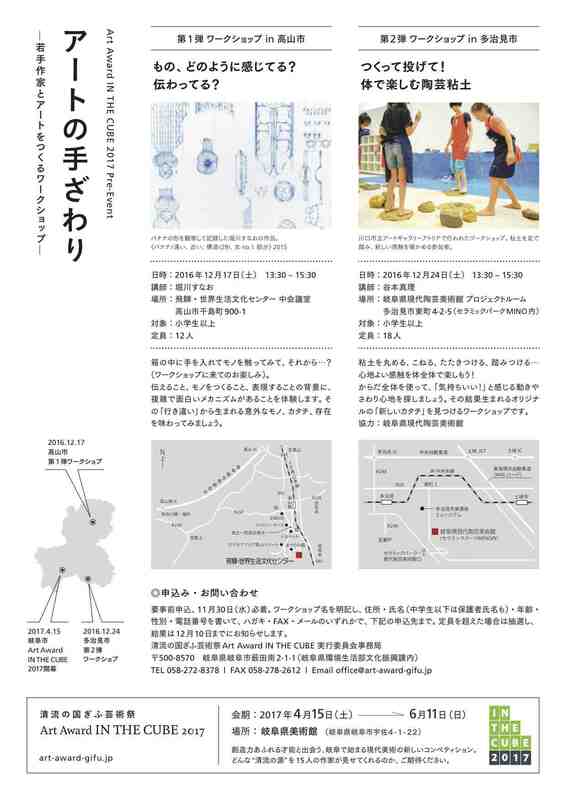 My solo exhibition was featured in KYOTO SHINBUN(news paper in Kyoto) by Hironori Yasukochi who is a Curator at Kyoto Municipal Museum of Art.